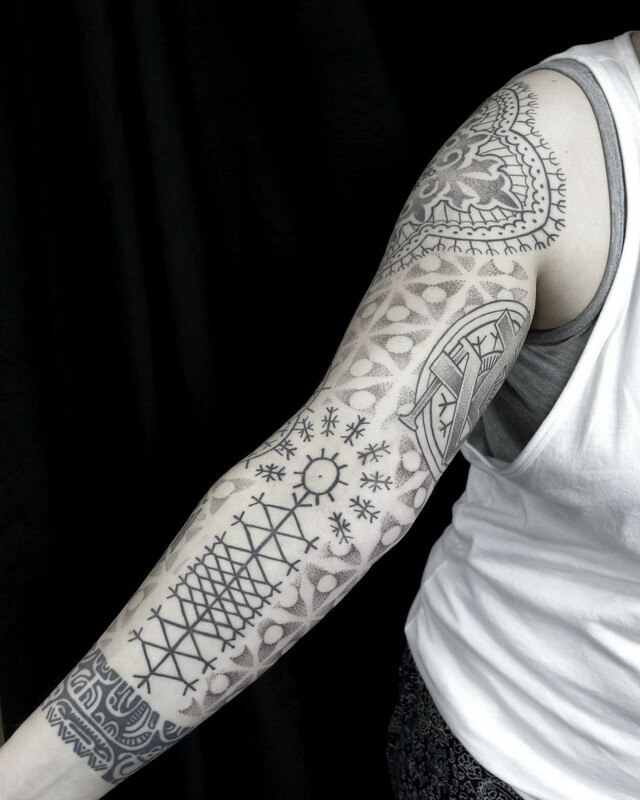 Kate was very dedicated to her tattoo as she is to her Christian faith, the tattoo is all based within Croatian Christian symbols and the concept of the trilogy. 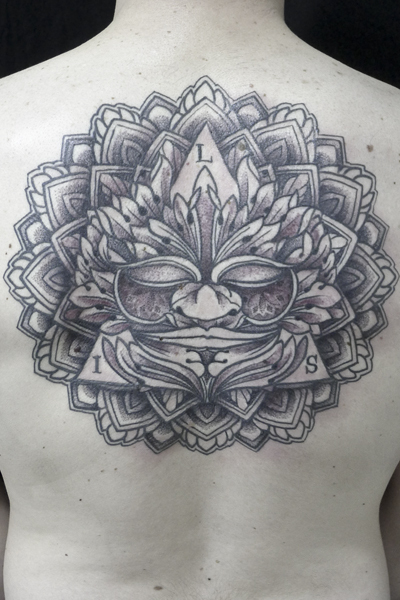 It was an immensely satisfying project. 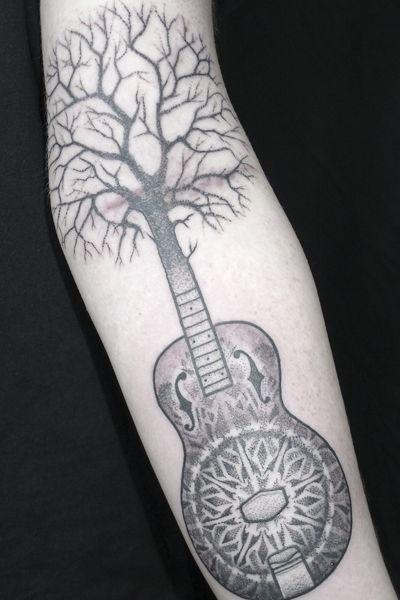 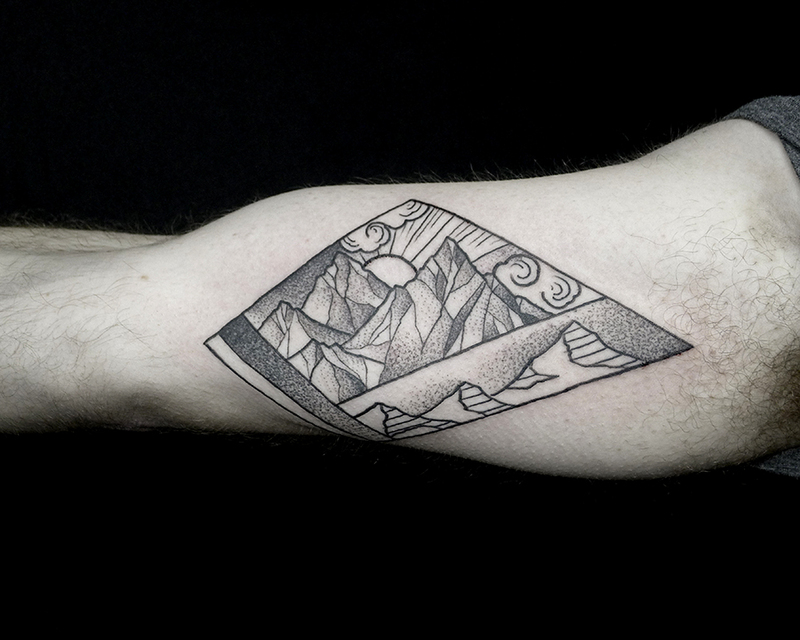 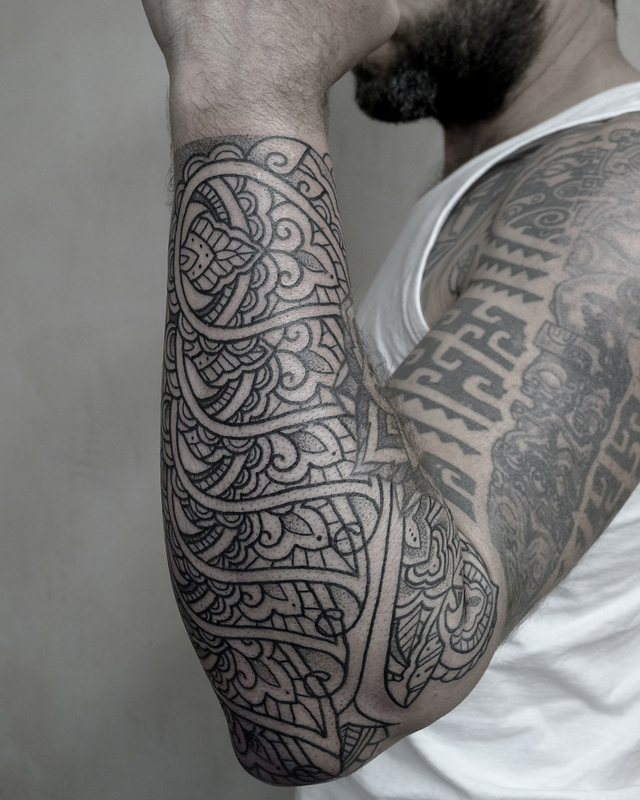 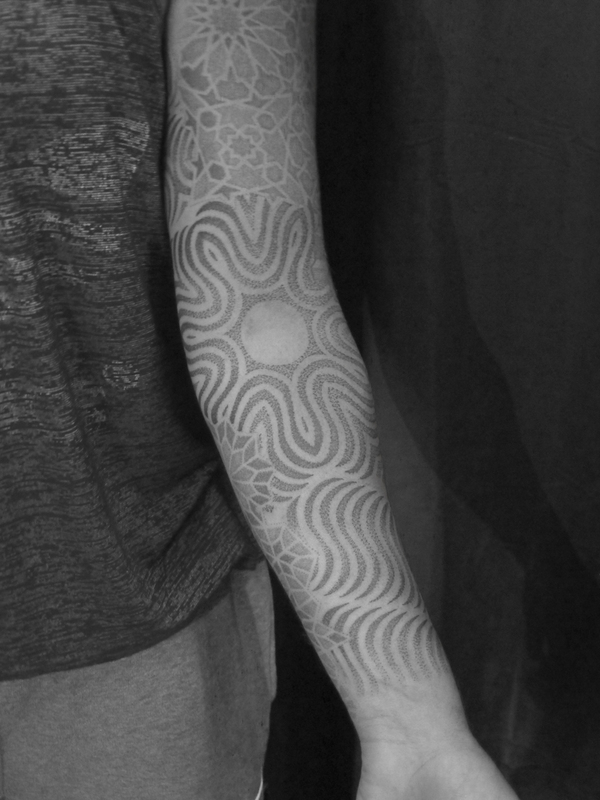 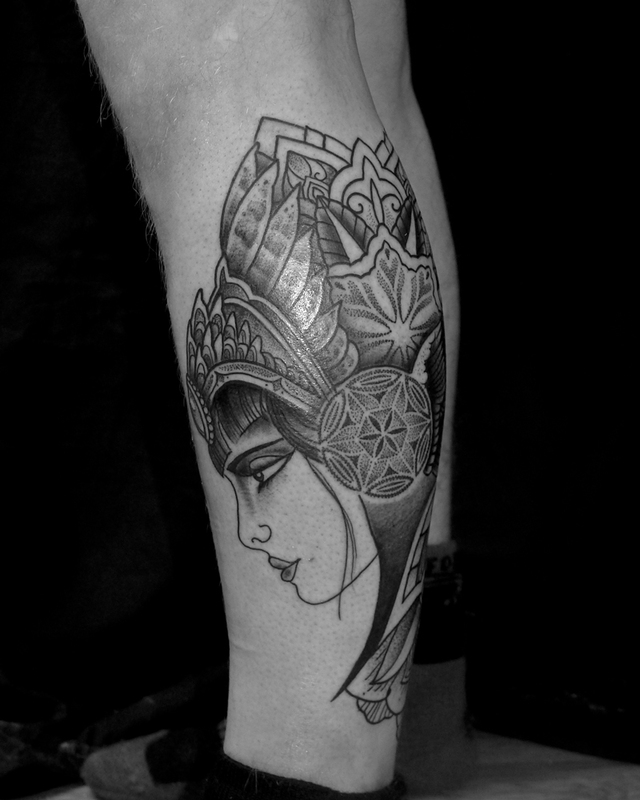 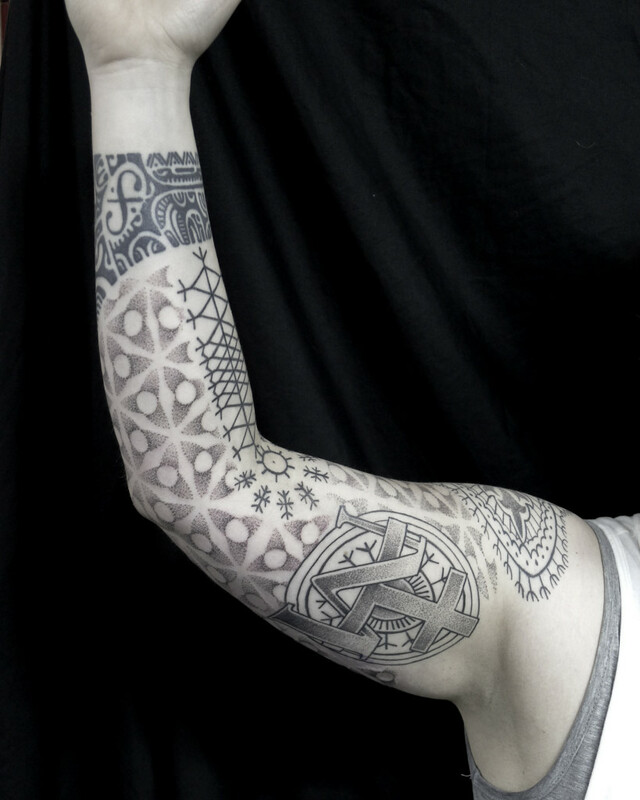 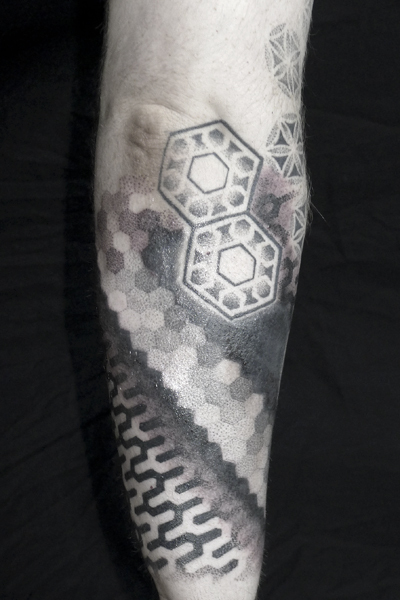 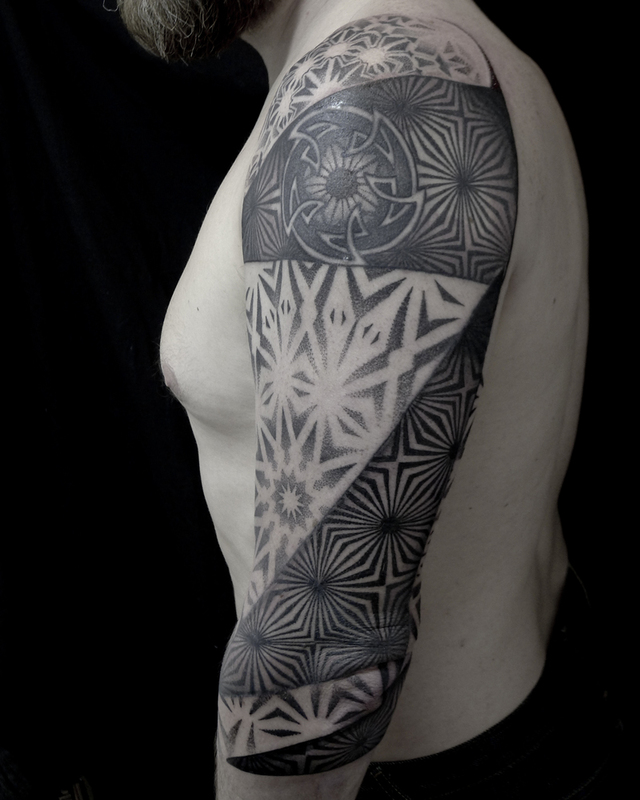 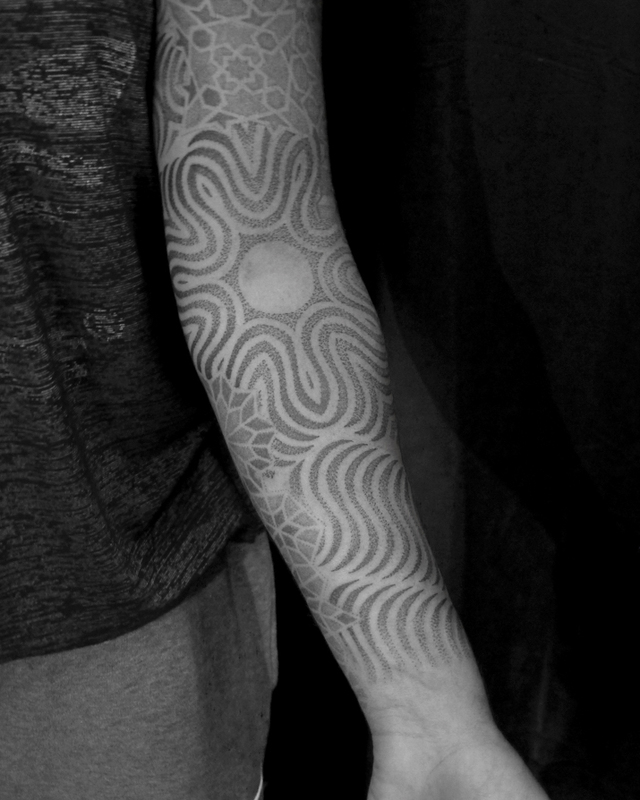 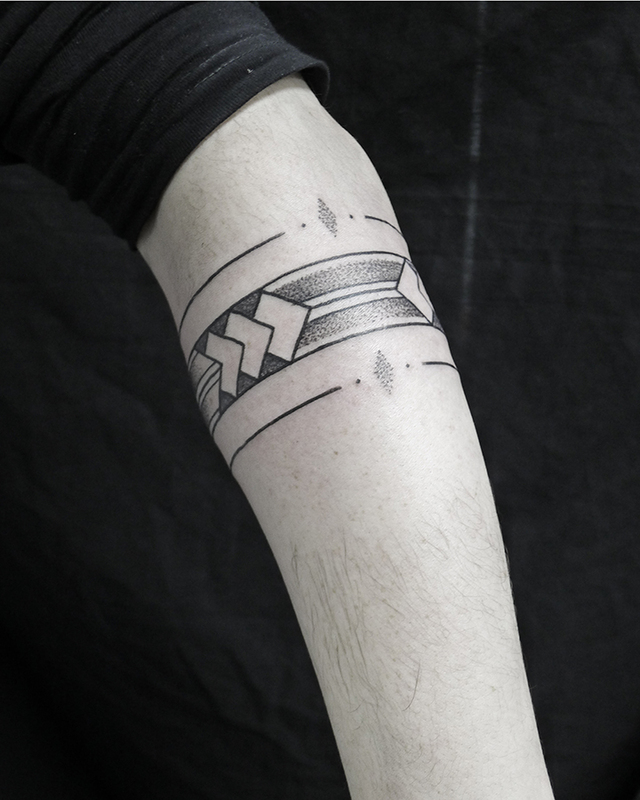 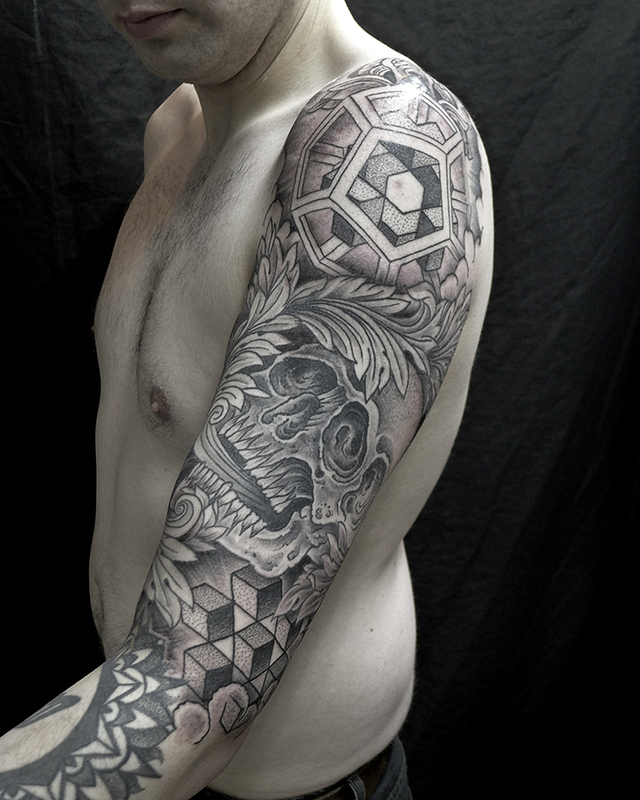 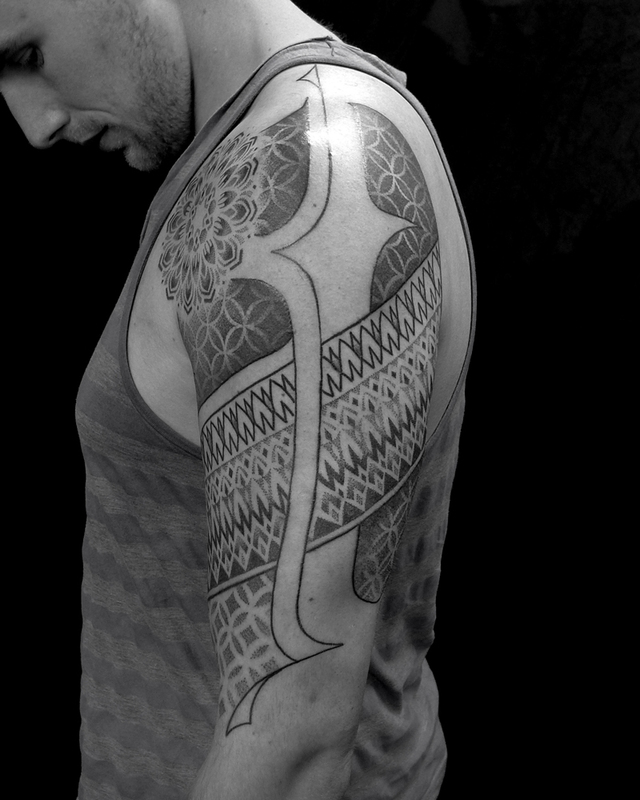 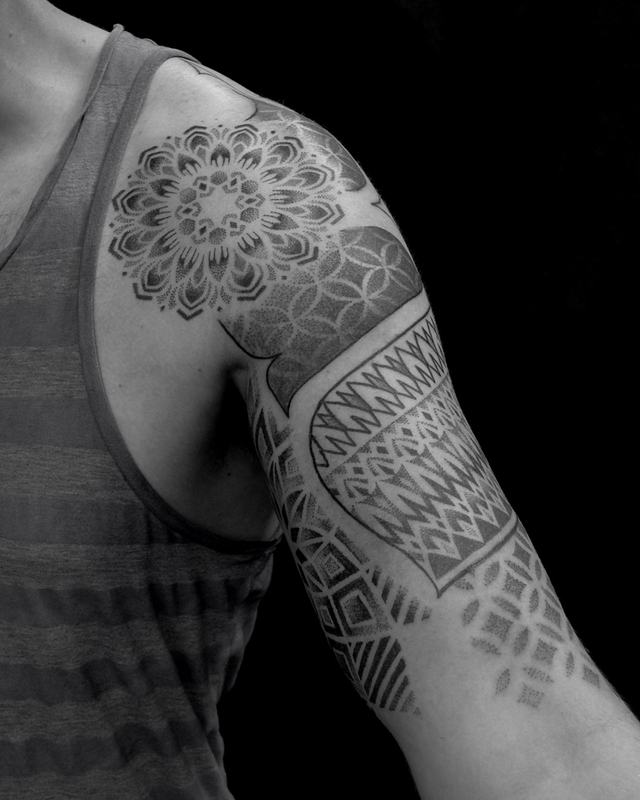 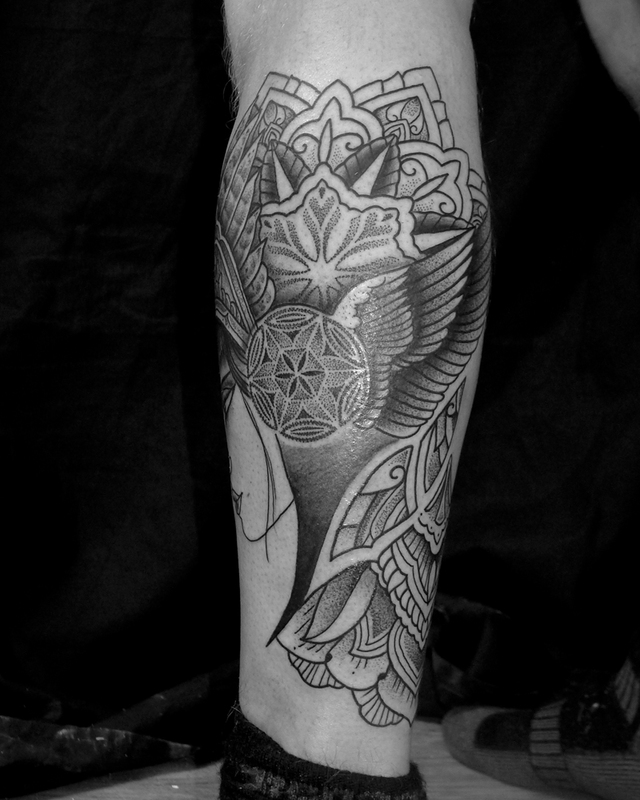 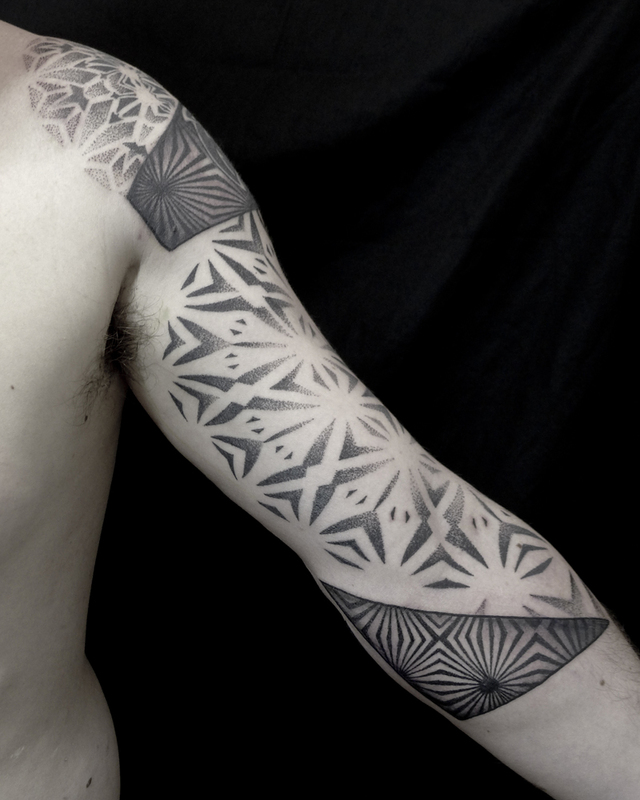 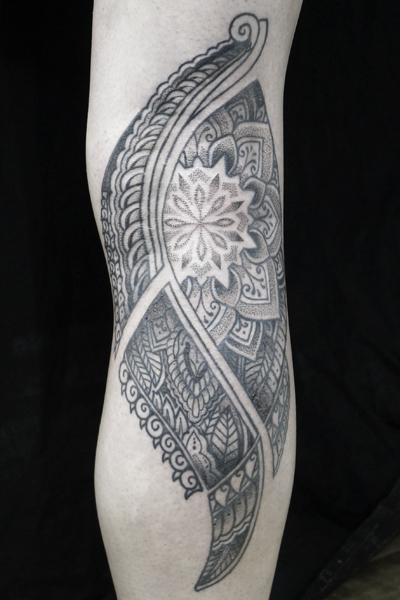 The Polynesian piece on the lower arm was done by the infamous Phil Cummings. 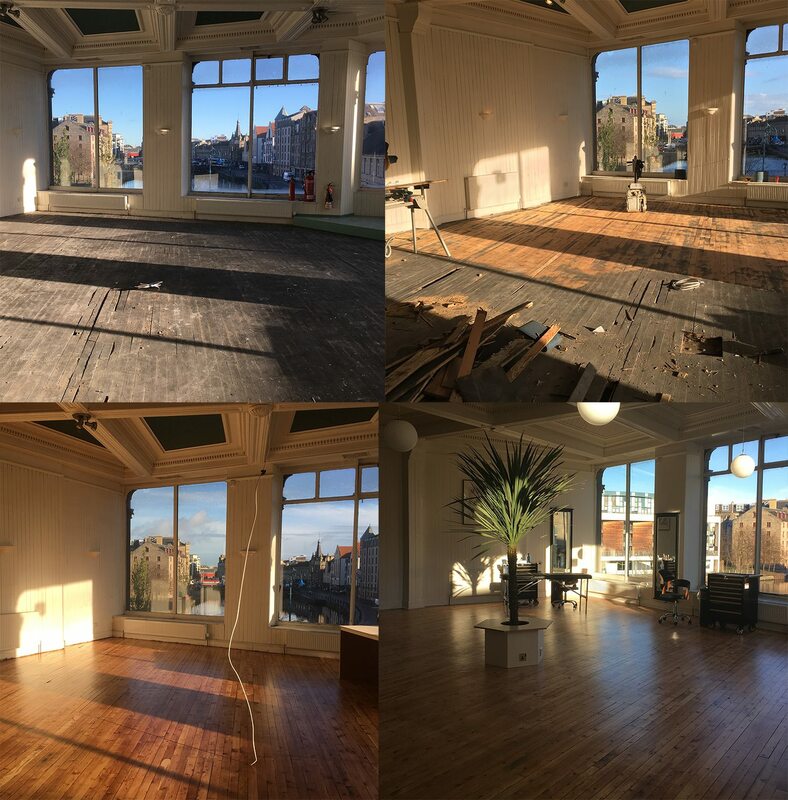 ….And in with the new. 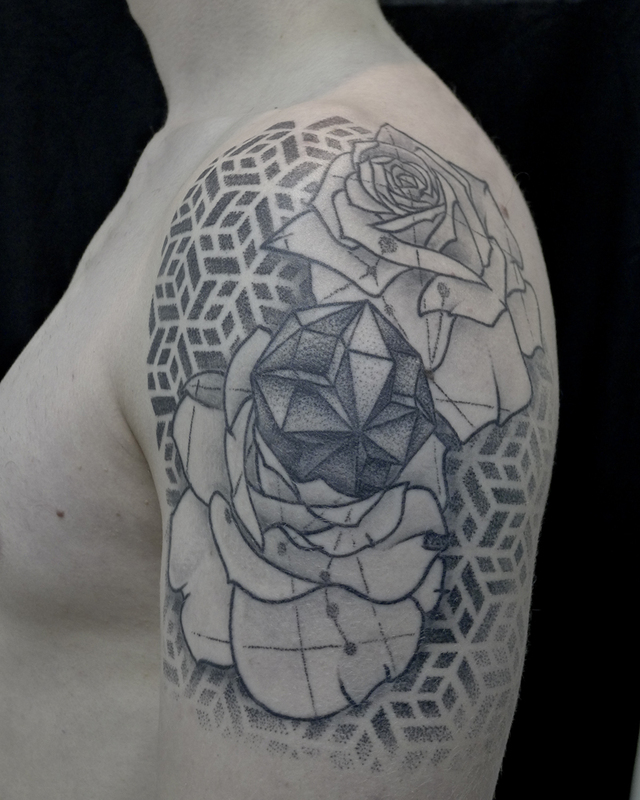 So here’s the last of last years work. 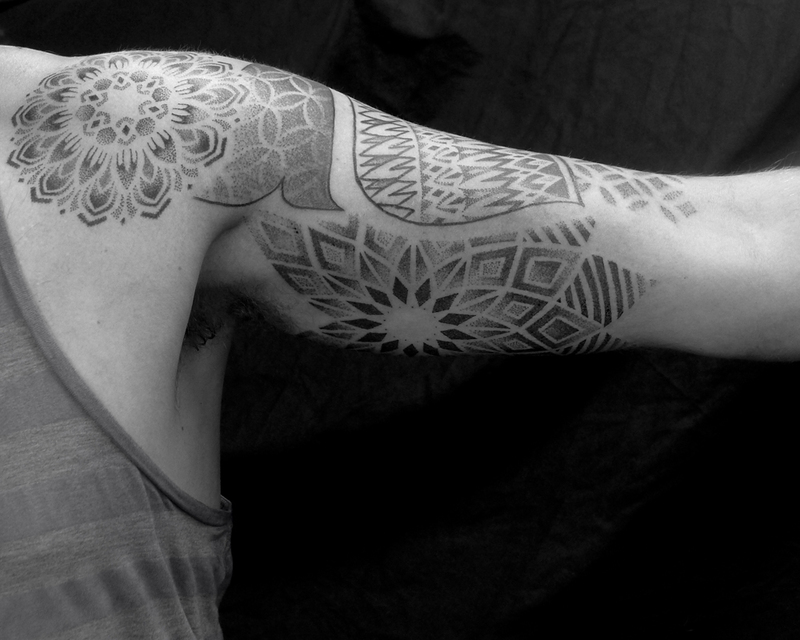 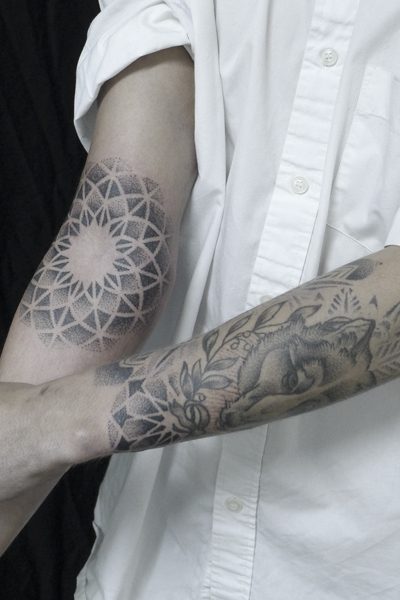 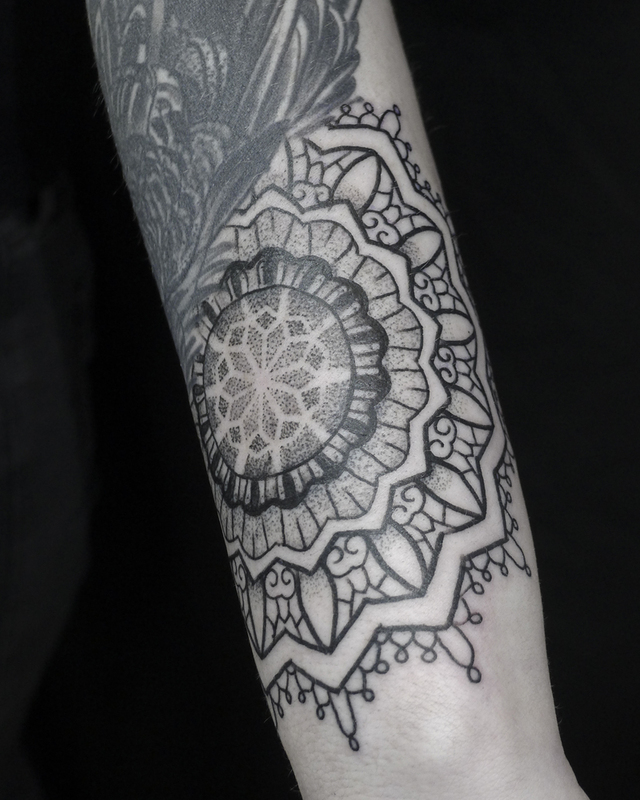 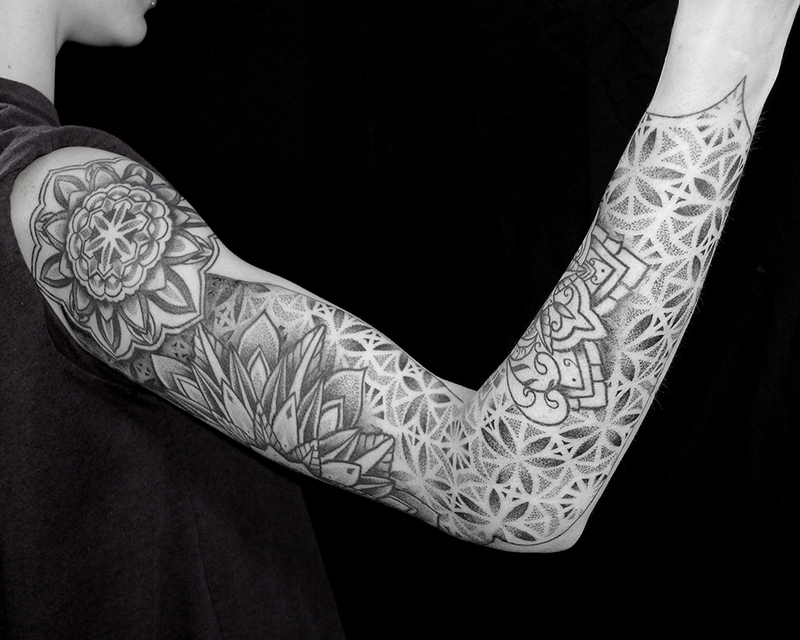 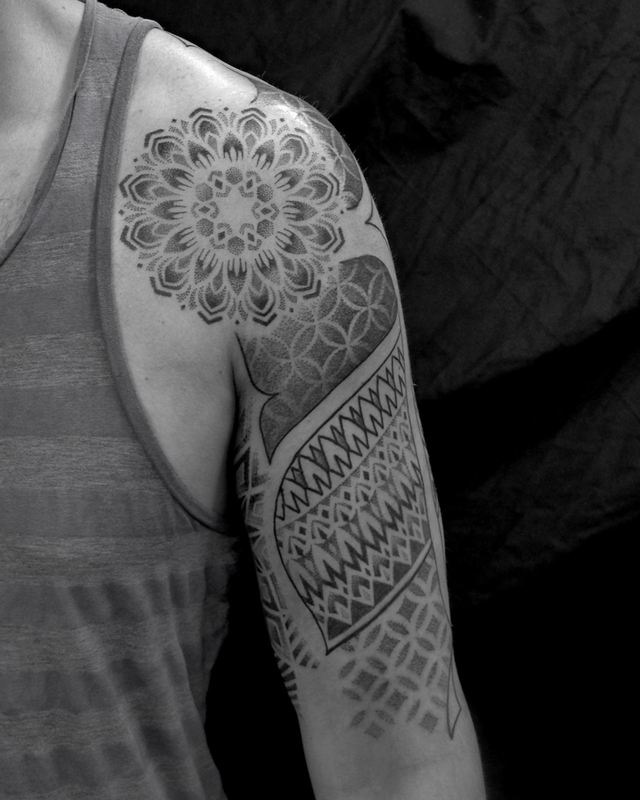 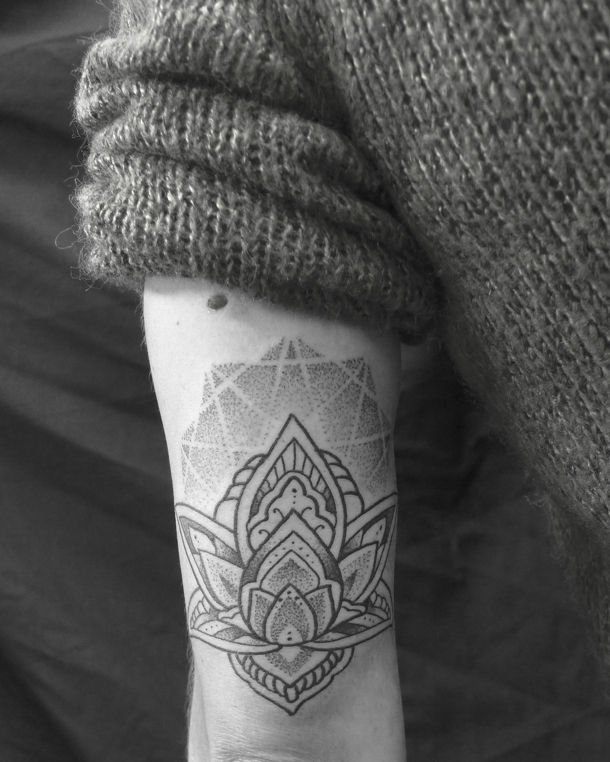 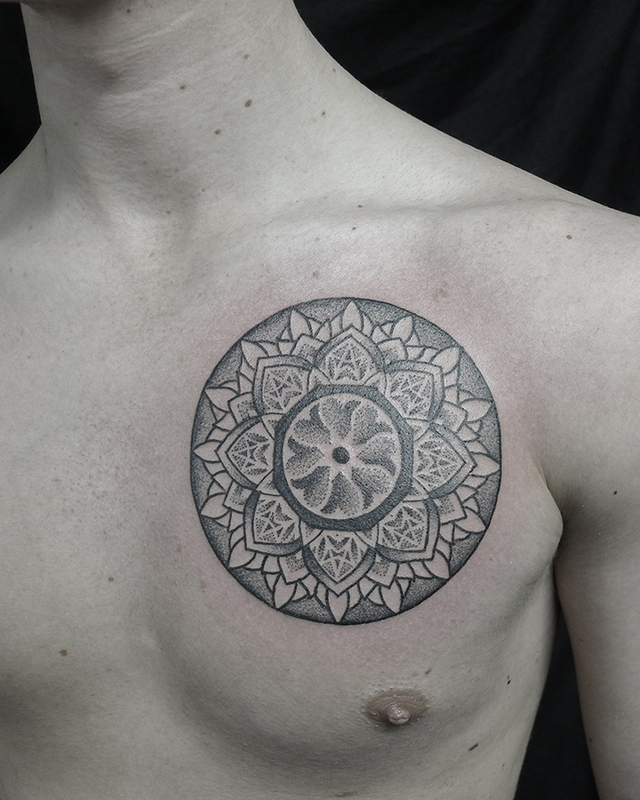 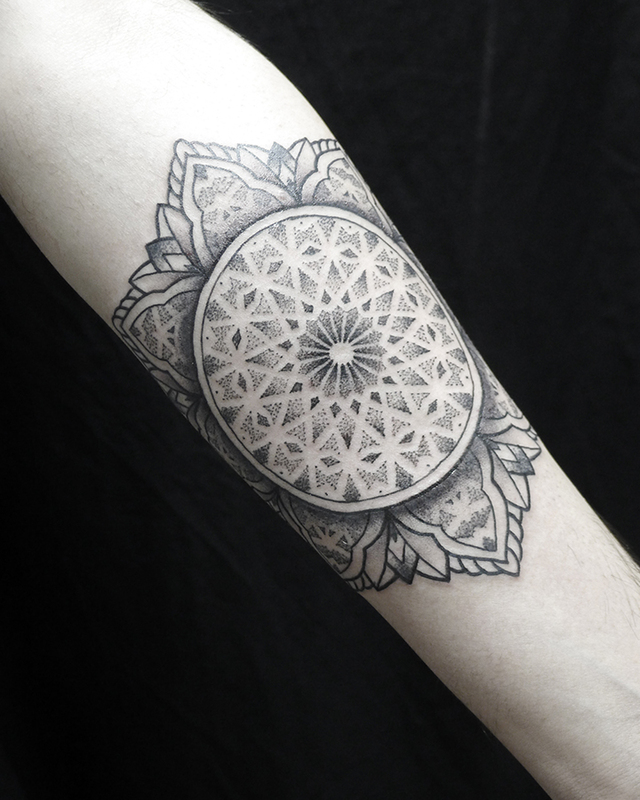 Here are some pieces some of which are healed, like the mandala on this first piece, with other new tattoos. 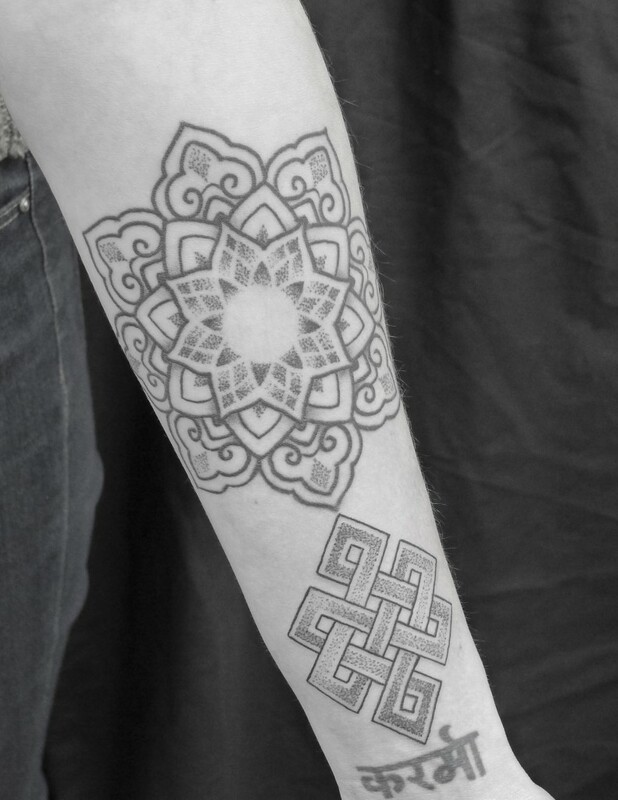 The endless knot here is new – the sanskrit was not done by me. 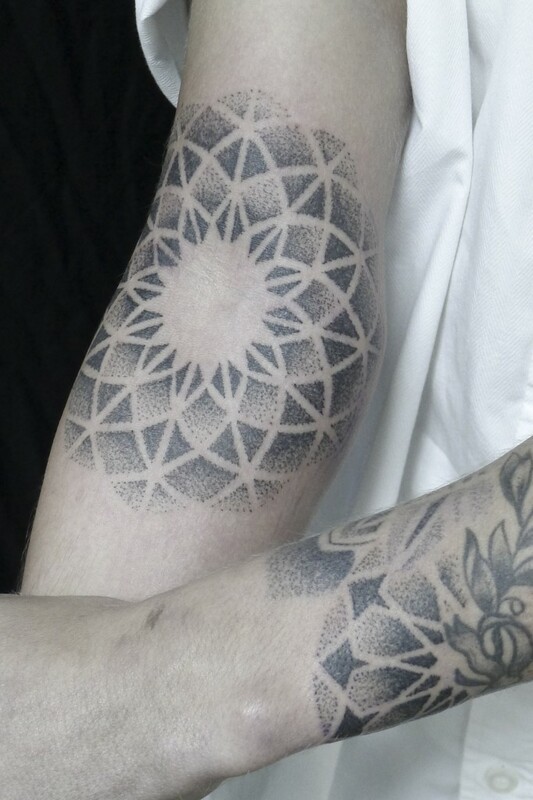 I filled in the spaces between some work by my friend Alvaro Flores who works in Melbourne, Australia at Korpus Tattoo. 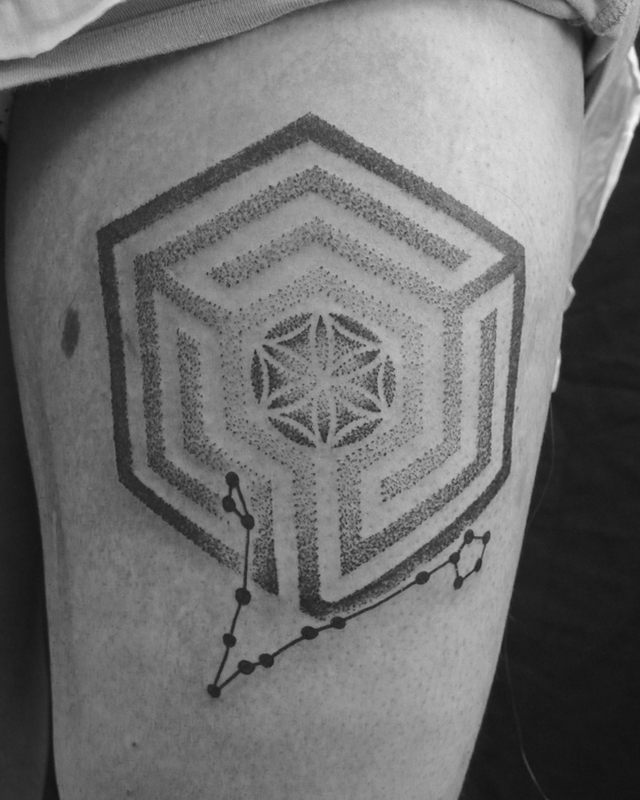 Maze, seed of life and constellation concept was brought in by the customer. 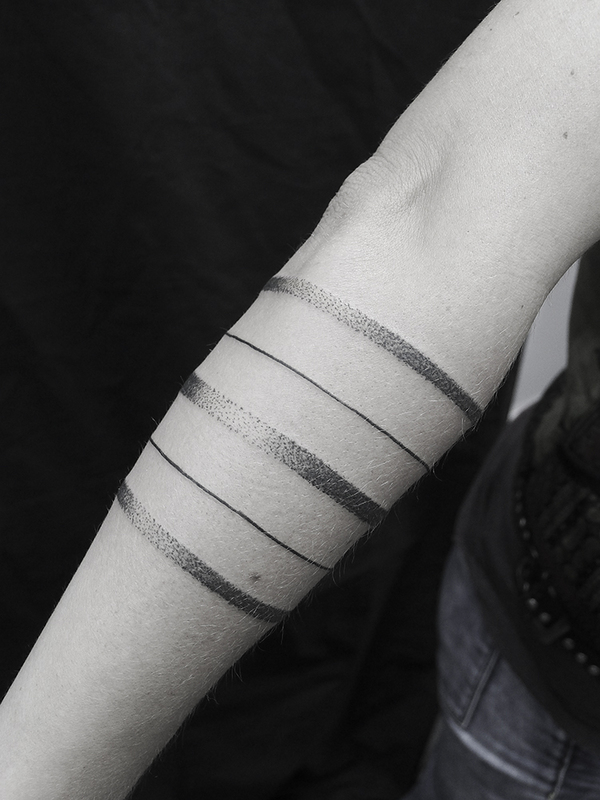 Interesting piece in as far as it covers a birthmark making use of it. 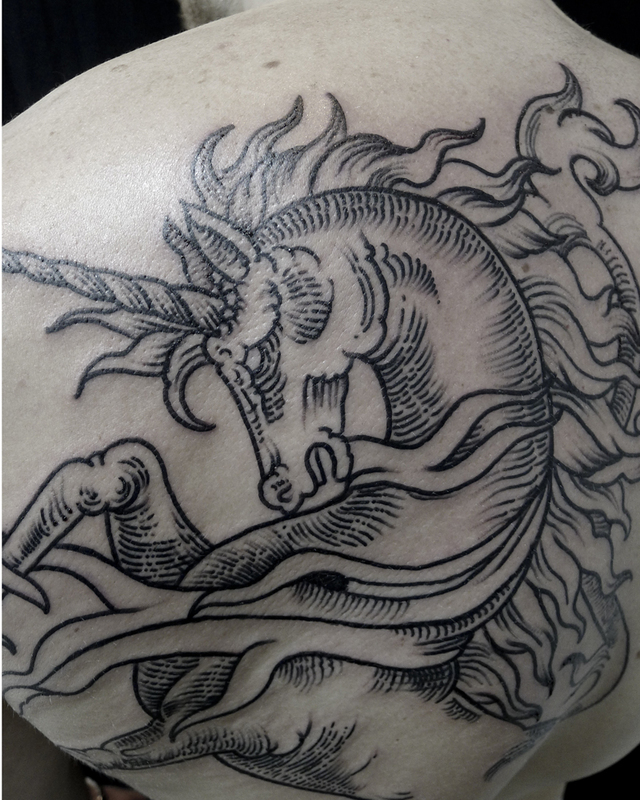 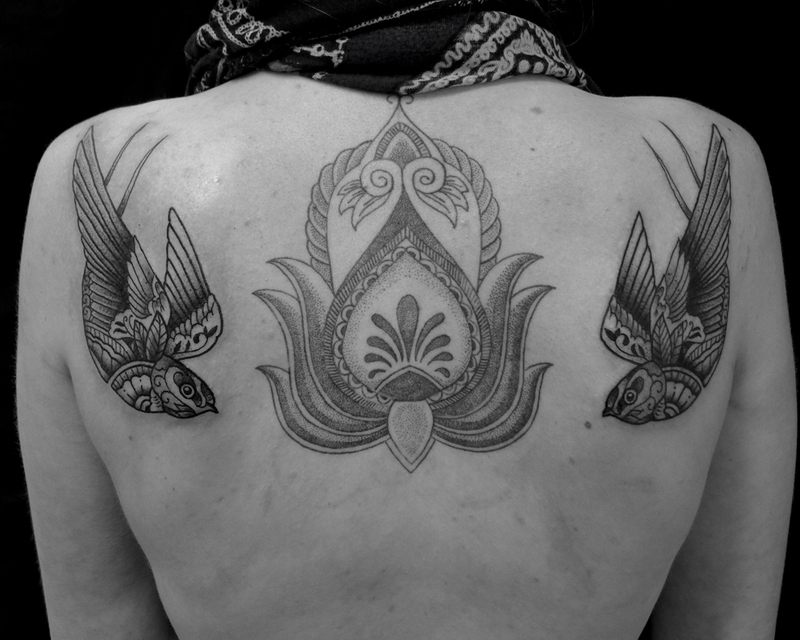 I managed to get a few shots of Asia’s healed tattoo from a short while back. 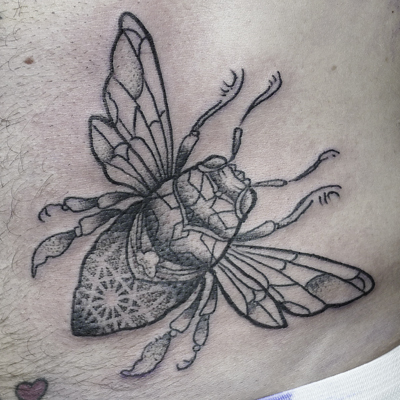 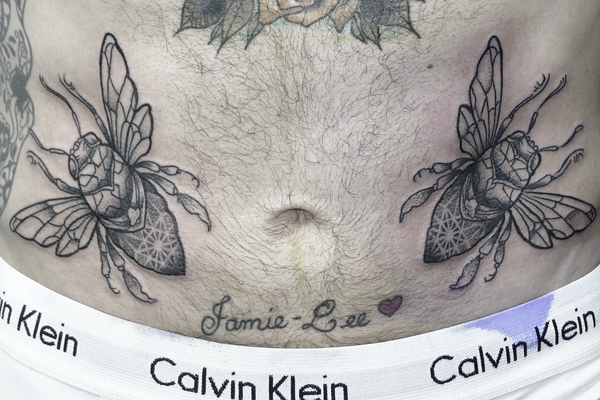 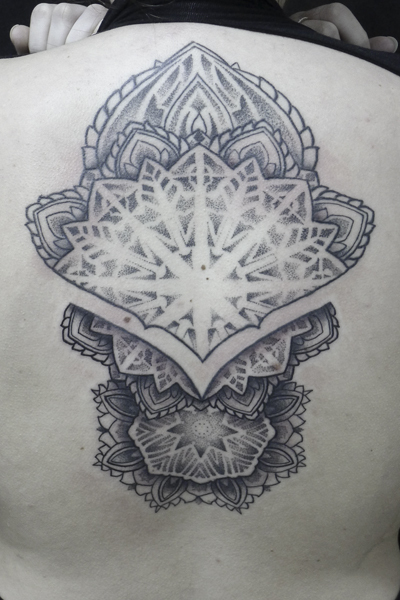 I did a cover up on her lower back which you can just see in one of the photos but my other pictures of it were out of focus….. I’m a tattooist not a photographer it seems. 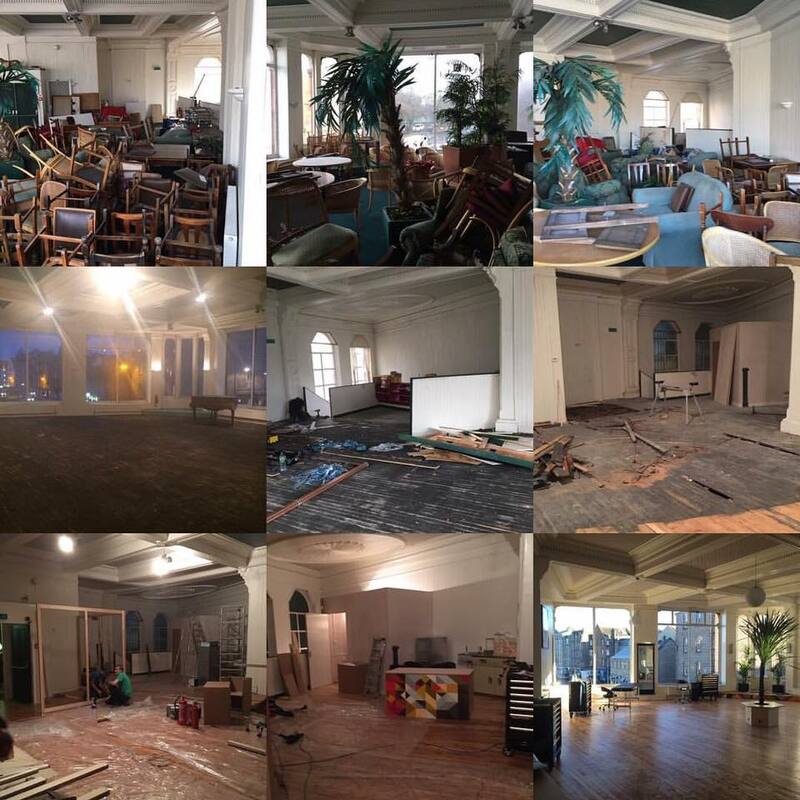 I’ve had some very interesting projects finally completed in the last few weeks – I decided that it’s far more interesting to put up complete works rather than ‘in progress shots’ which will probably work better with my slack blog updating schedule. 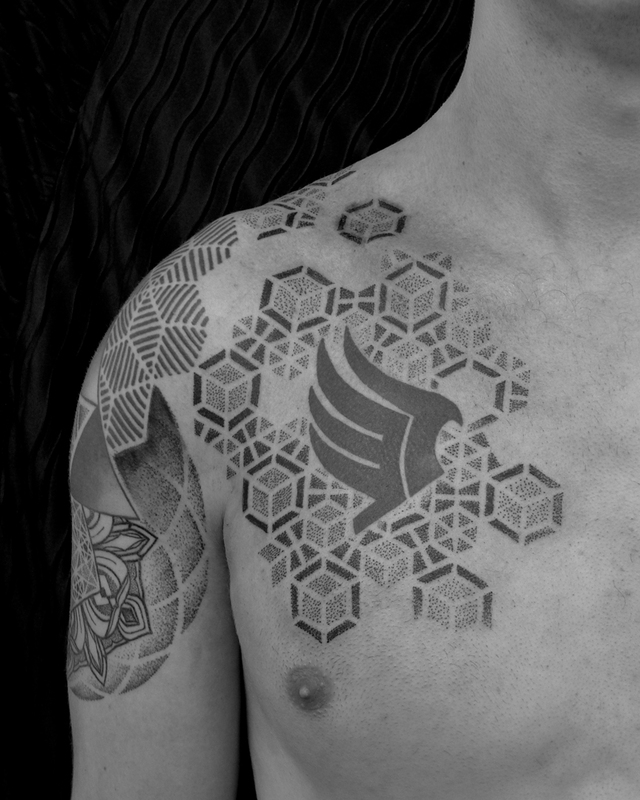 First up is Ian who has been having this top of arm/chest geo piece done over the last few months and I’m quite happy with the results and I hope he is too. 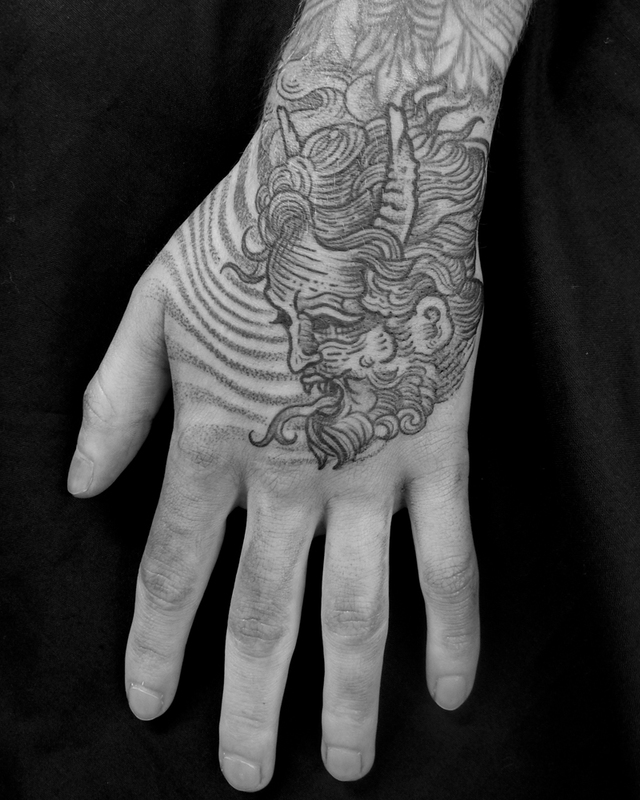 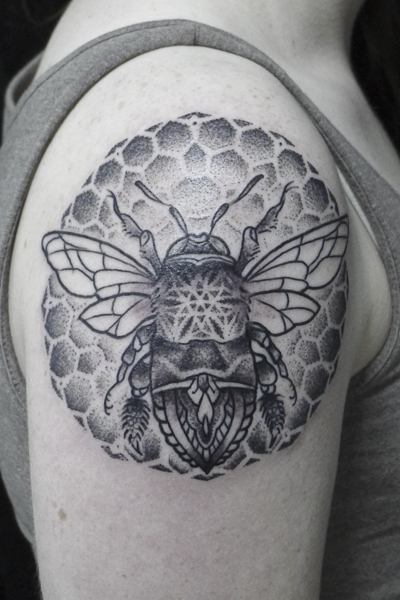 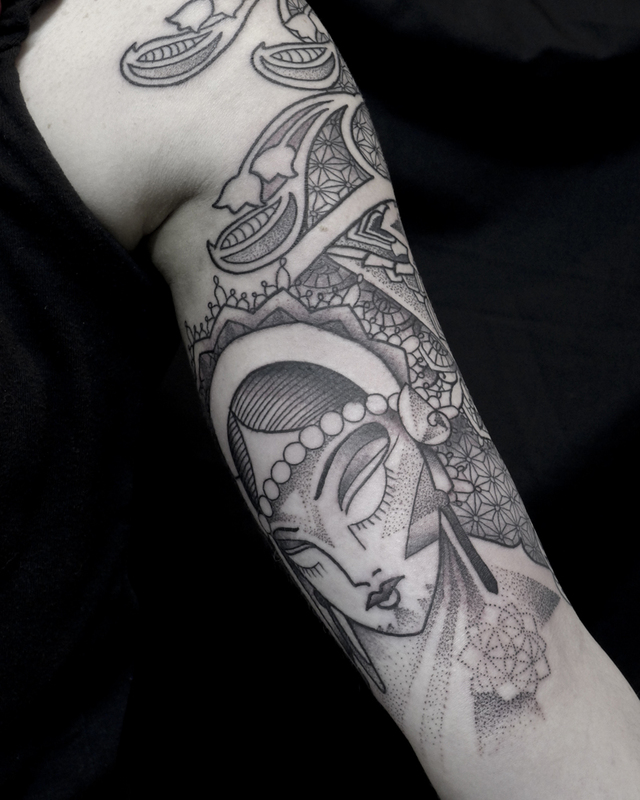 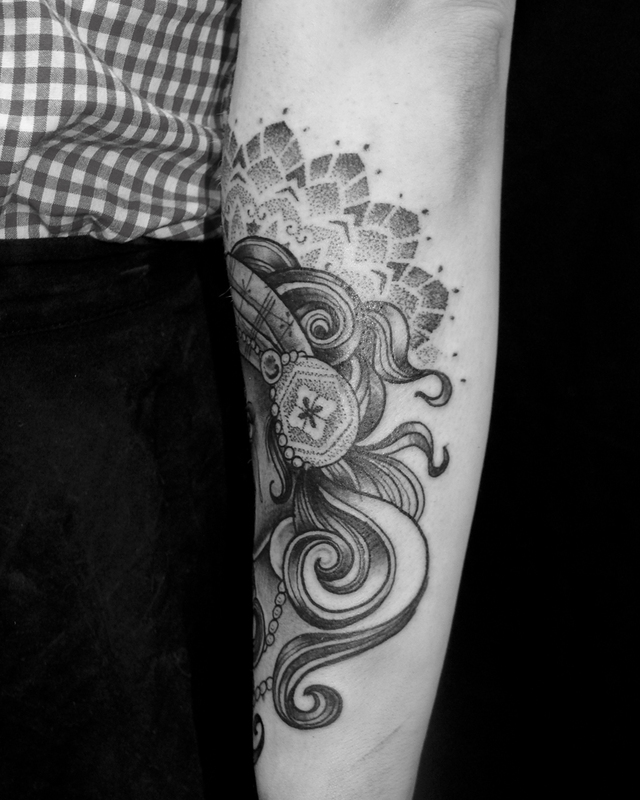 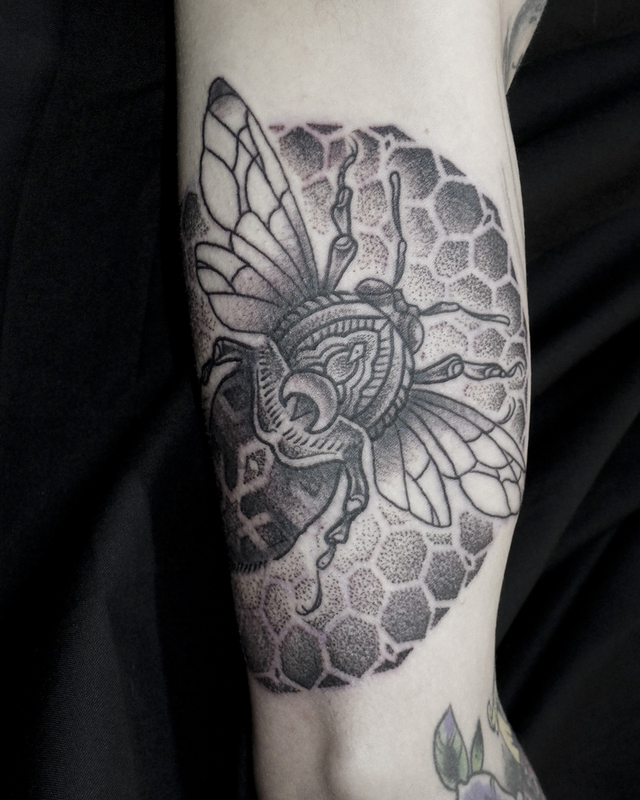 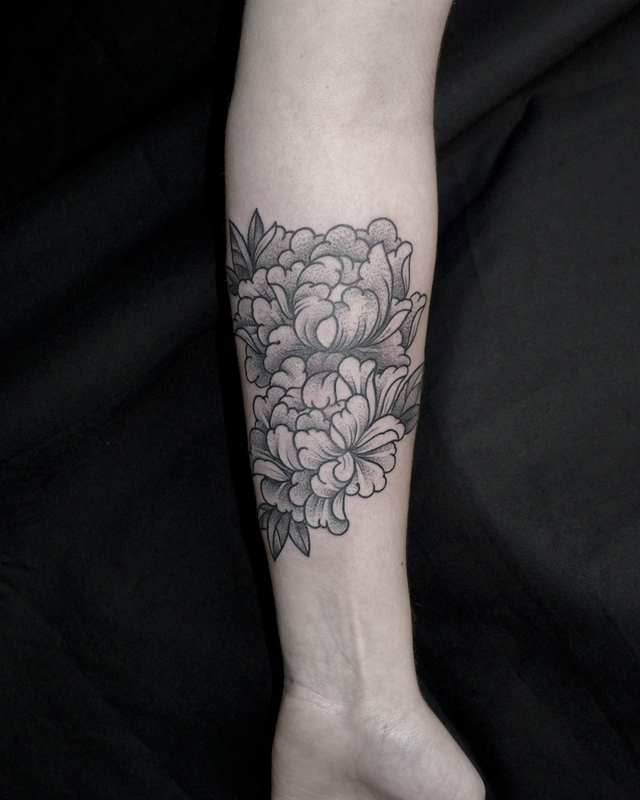 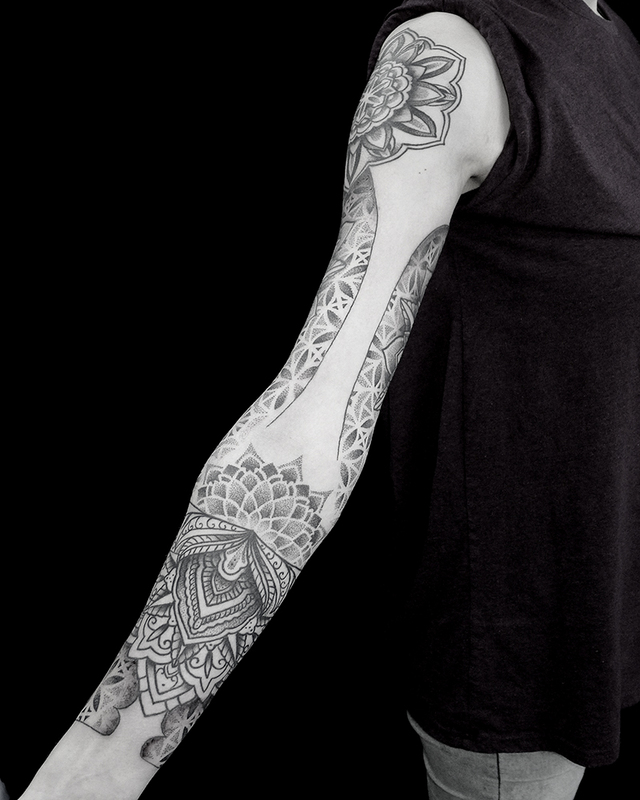 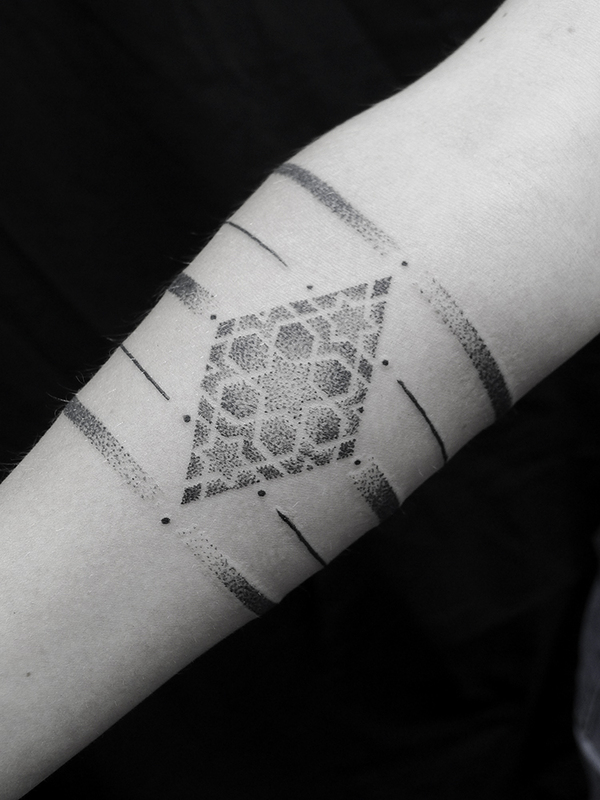 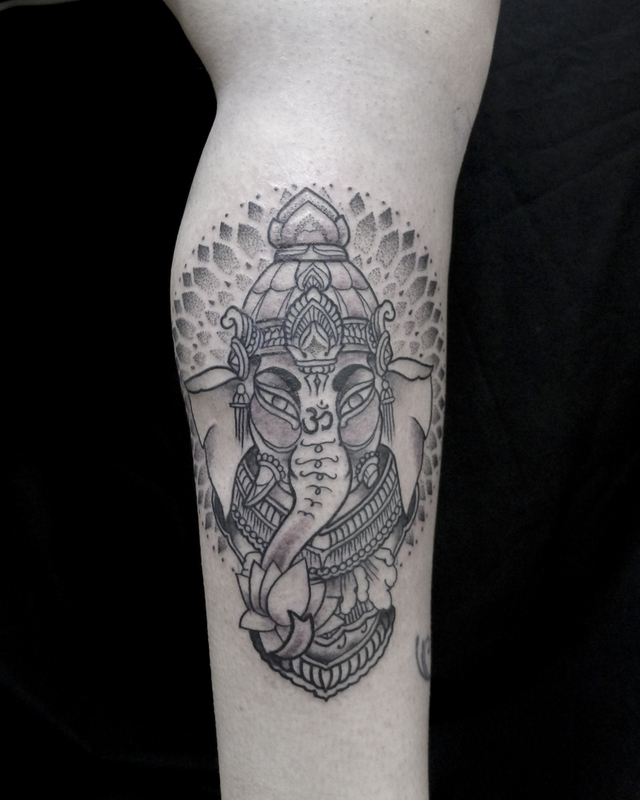 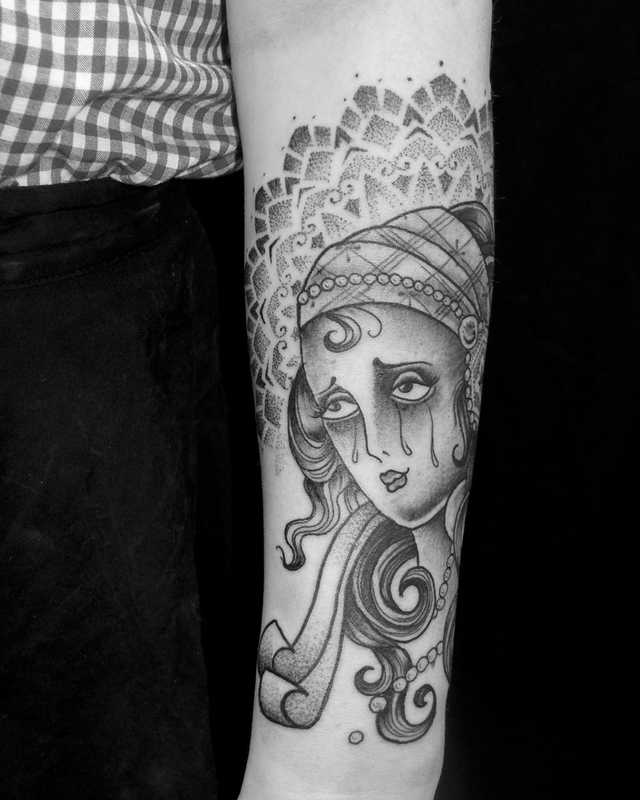 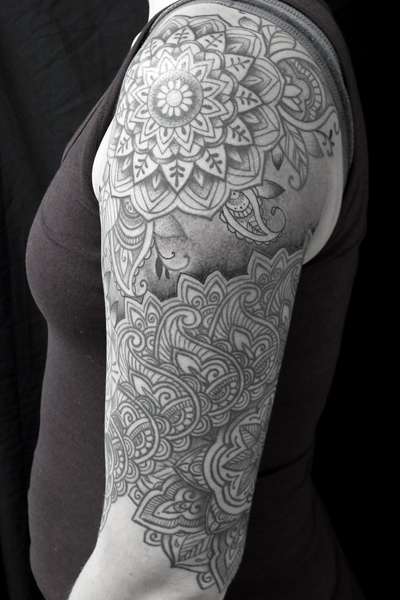 Mary has been very regular in her appointments meaning that we got this sleeve completed relatively quickly. 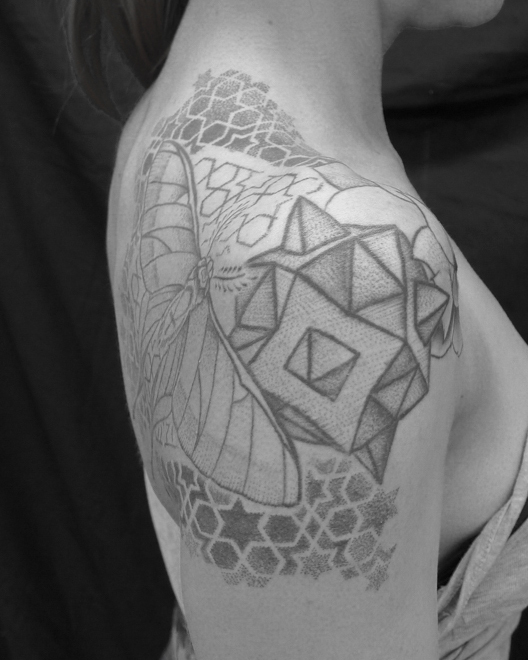 I tried to keep this piece light and delicate to an extent to suit her light frame. 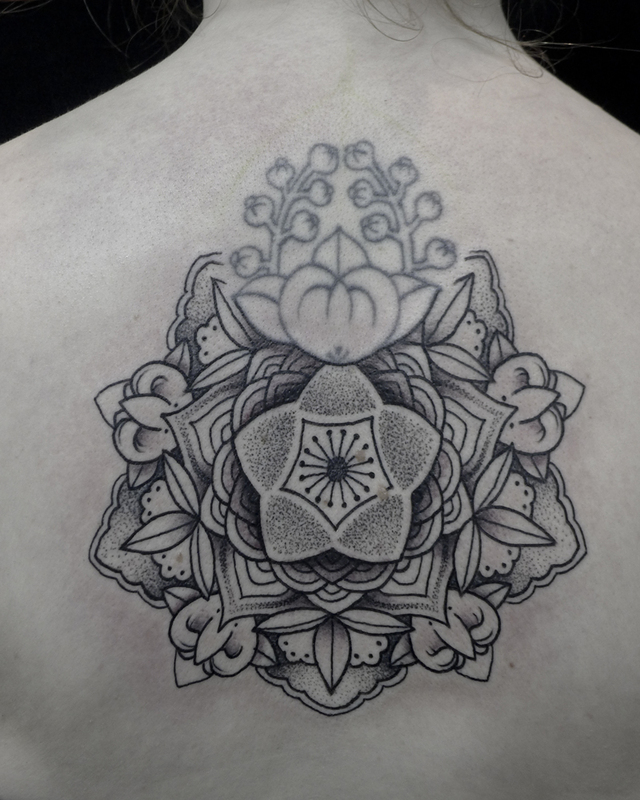 Apologies for the blood patch on this but we were pushed for time at the end of the session so the young lady could catch her bus back to Aberdeen. 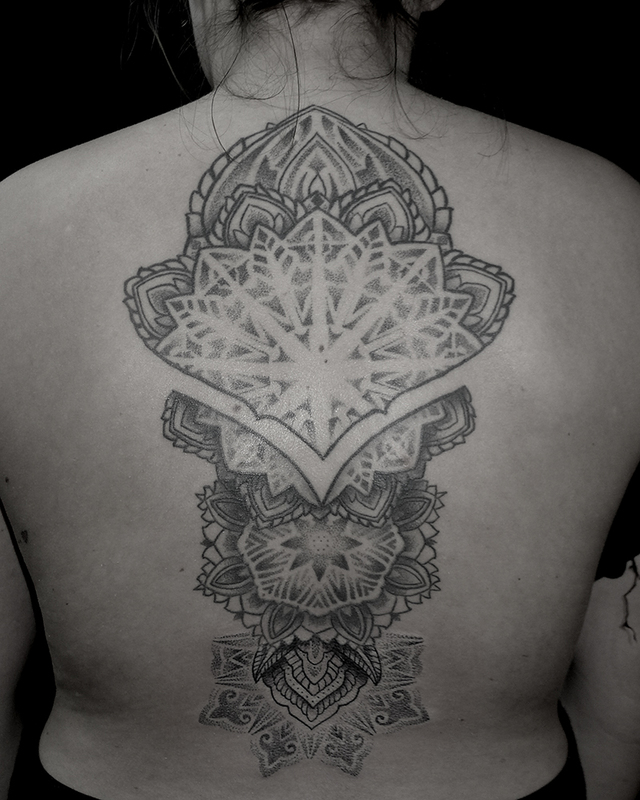 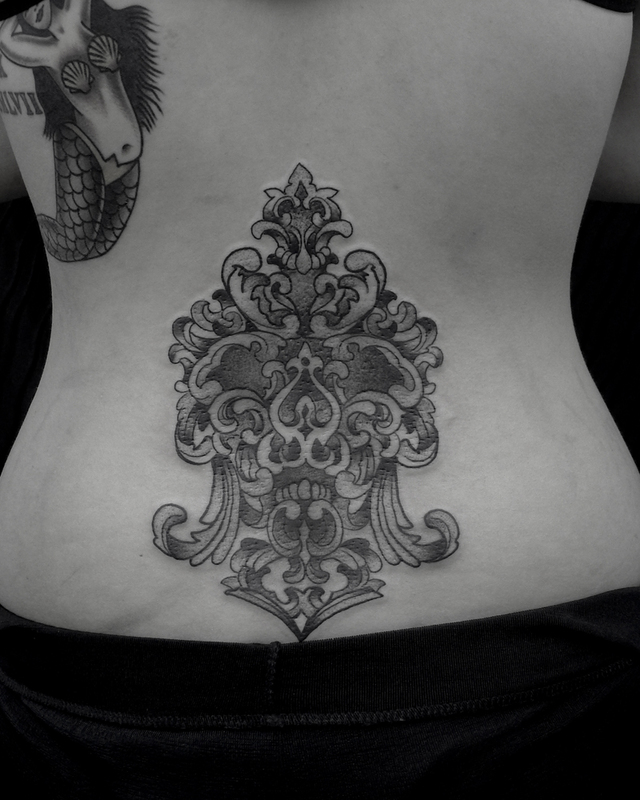 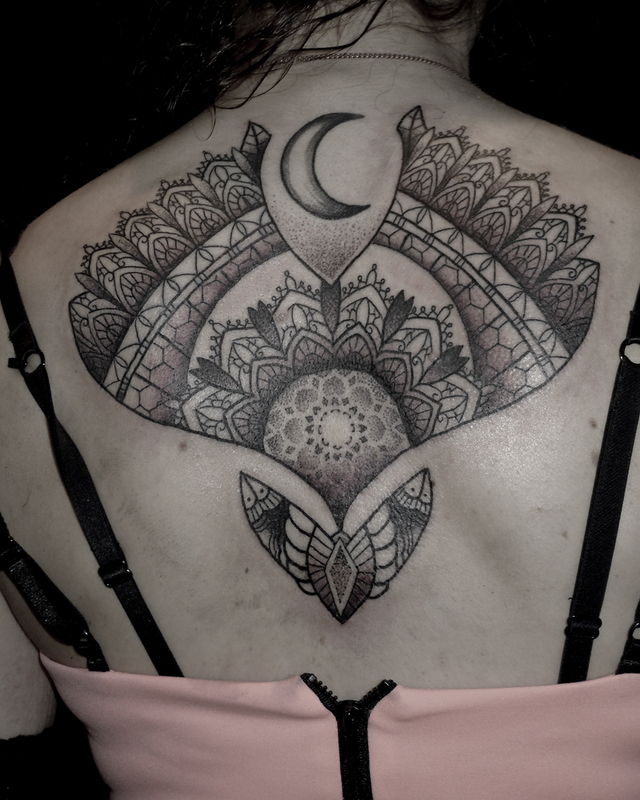 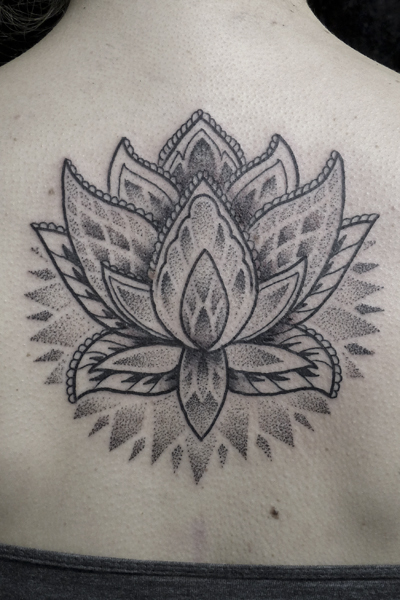 We finally finished Nicole’s backpiece with a simple dotwork motif – having been tanning herself and some of the tattoo is 9 months old makes the picture look a little unbalanced. 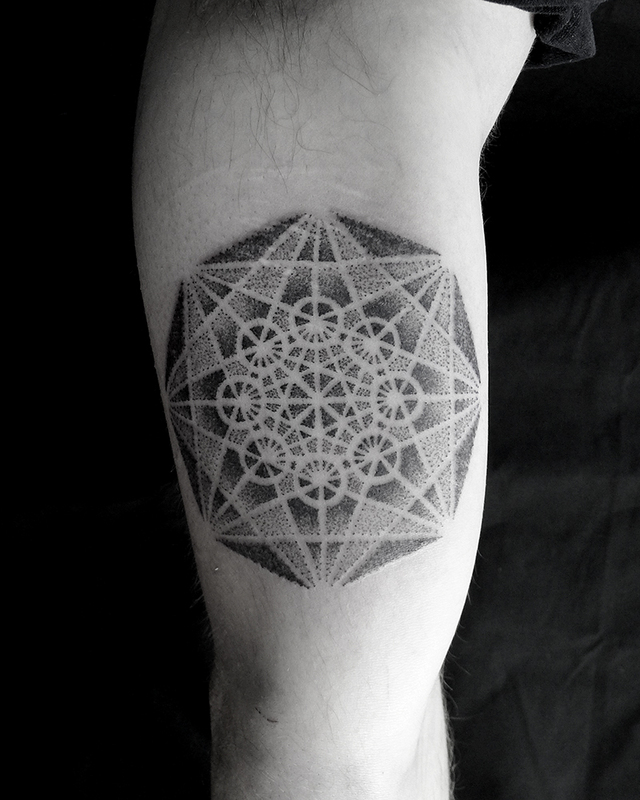 A fun bit of Sacred Geometry for Daniel – apparently it was from an old book cover. 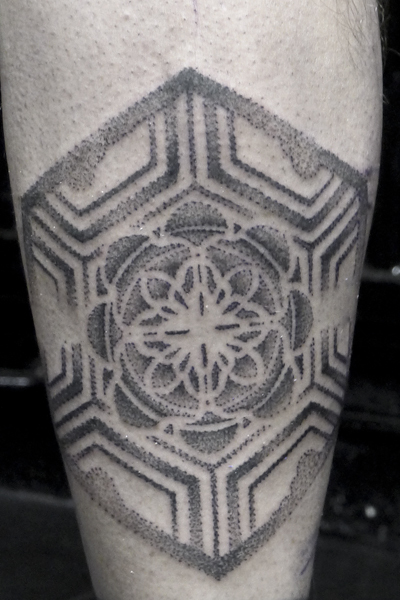 Lastly this was a bit of a test – 5 freehand bands around the arm with a small Arabic pattern cartouche – although I was nervous about doing this I really enjoyed it in the end. 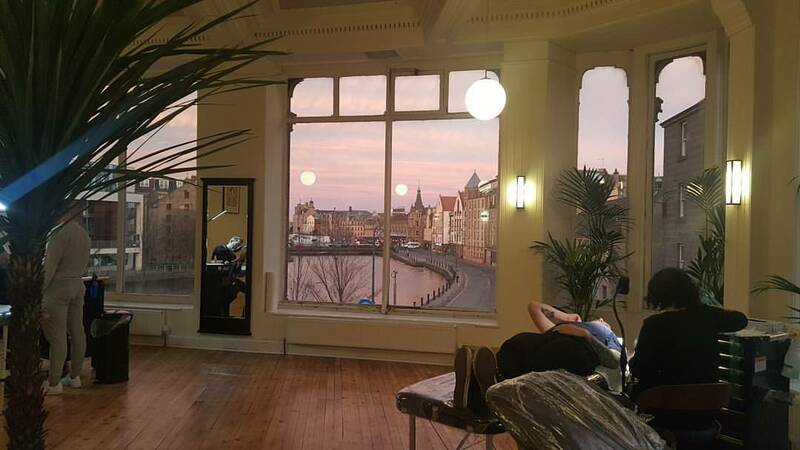 I’ve had some fun in Edinburgh and also at my guest spot in Liverpool for which I want to thank Richie and Paul at Forever True Tattoo for being fantastic hosts and gentlemen. 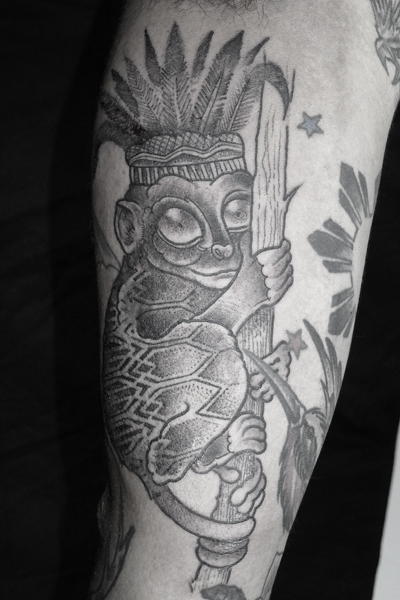 I always enjoy my stay at the studio and they make me feel completely welcome and like a part of the crew – cheers guys! 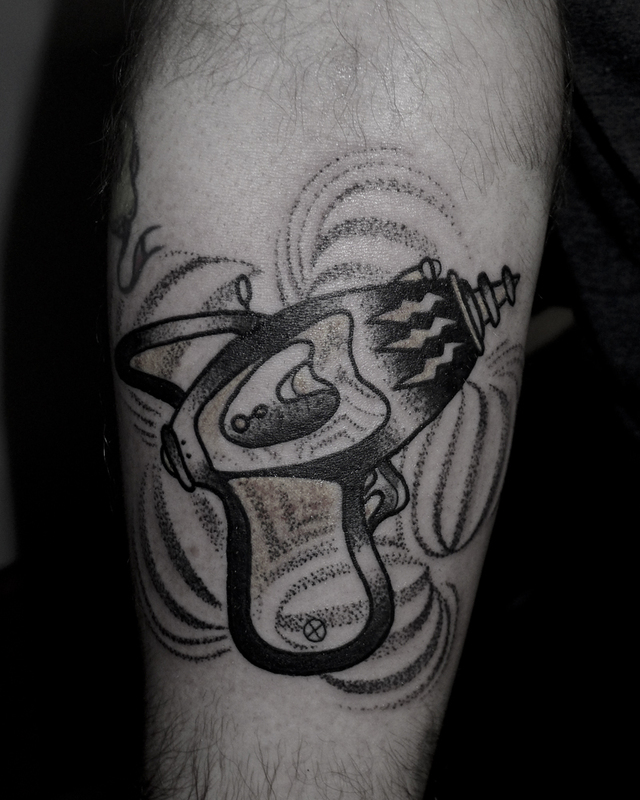 In Liverpool I did some fun work too and here are some of them. 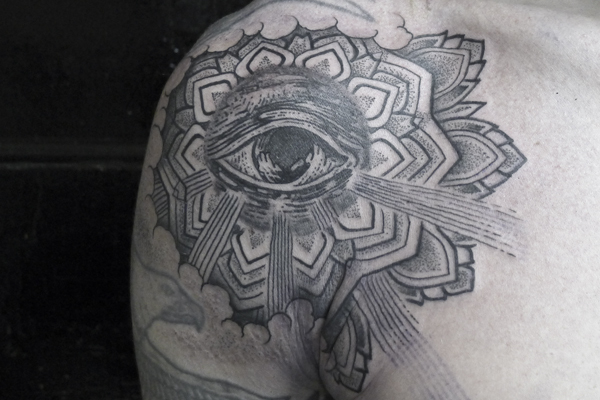 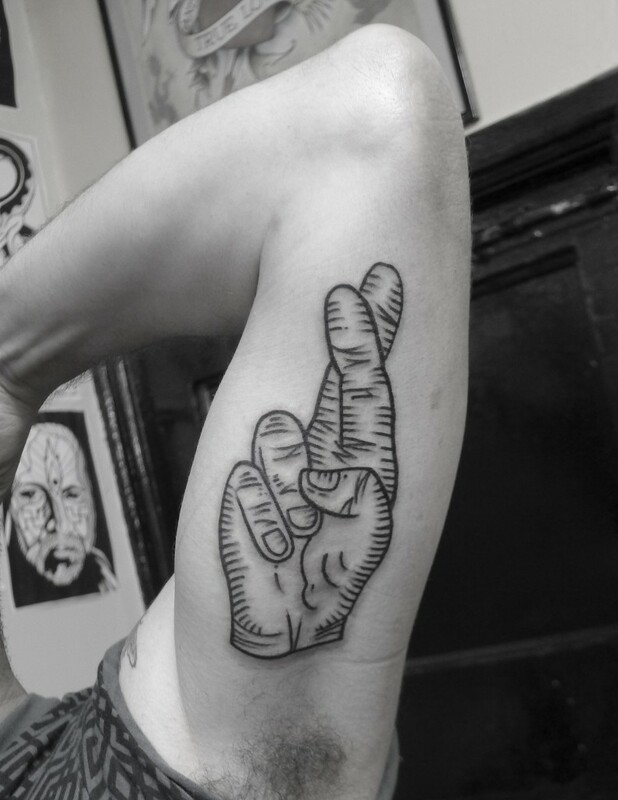 Jack who I have been tattooing in Edinburgh came across to Liverpool too. 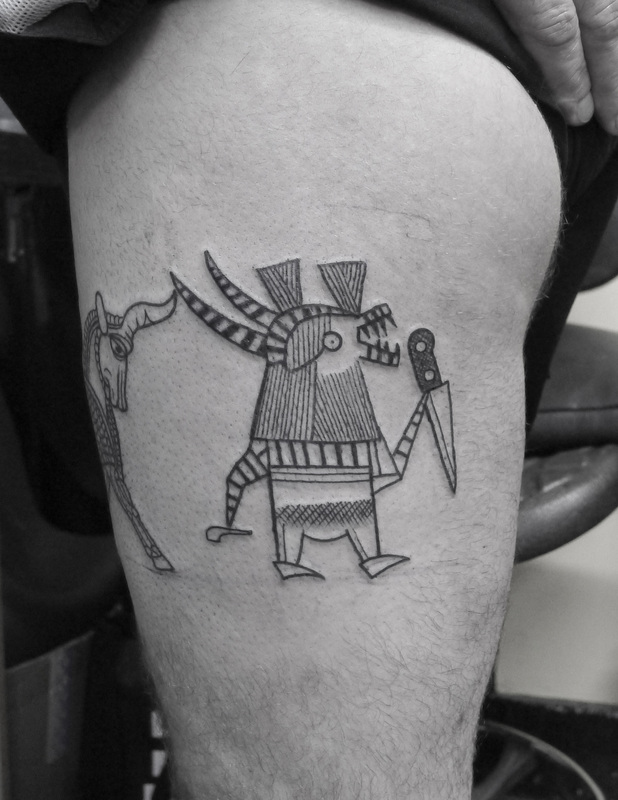 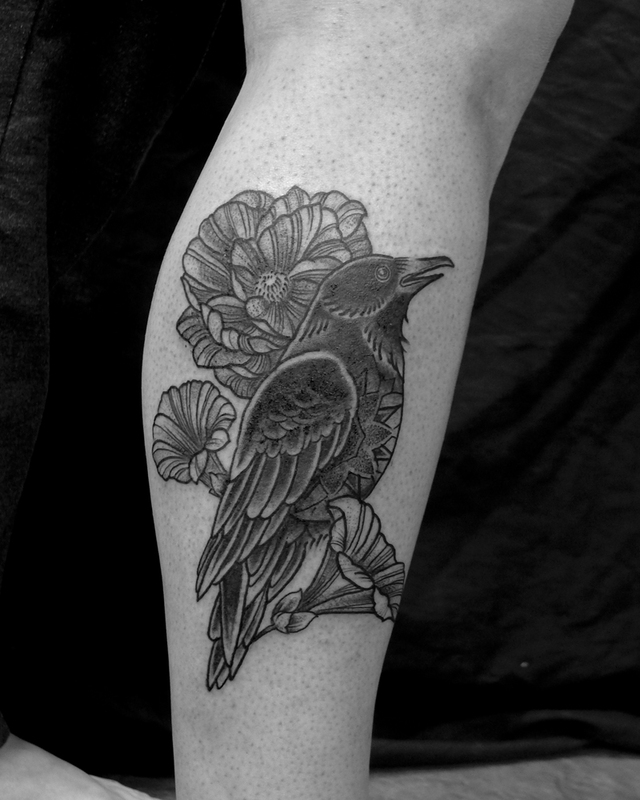 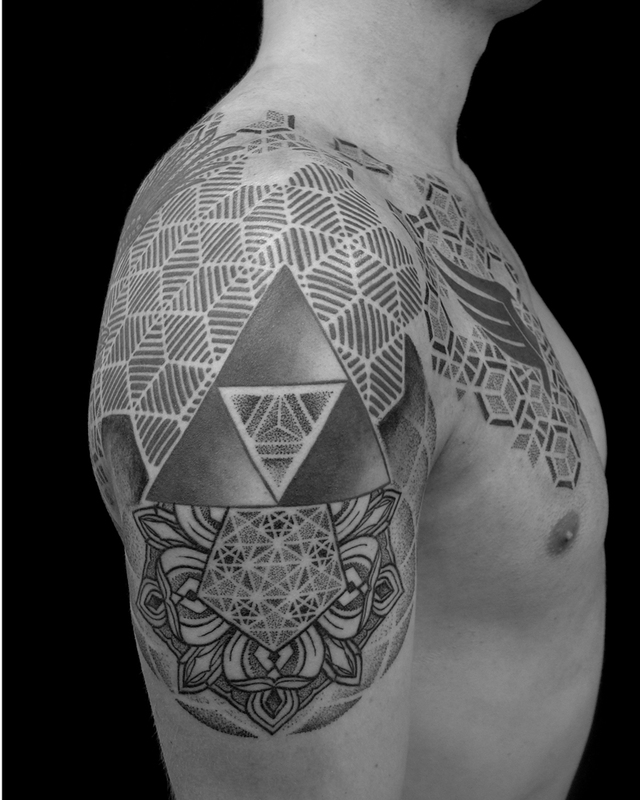 To reiterate – I did not do the triangle/zelda, the strip pattern or the crow which Jack already had and for the life of me I cannot remember the name of the tattooist for which I apologise. 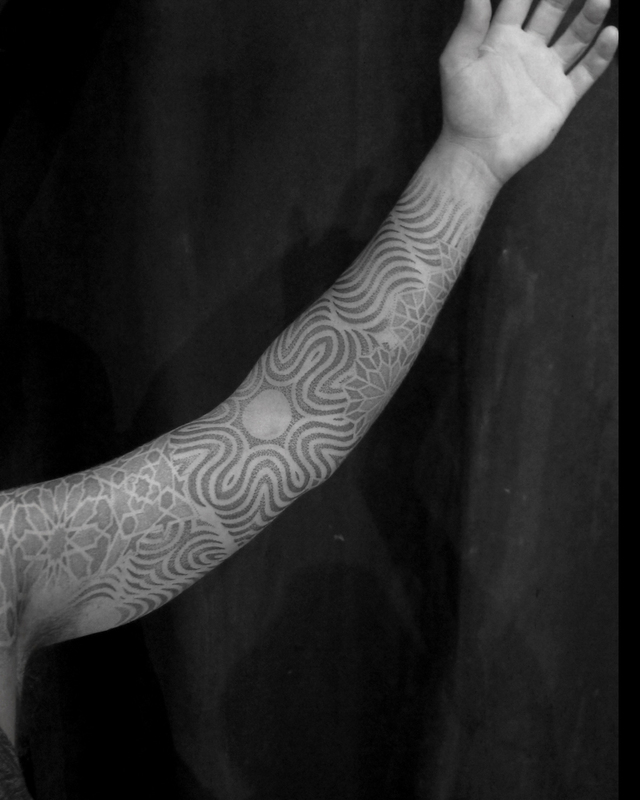 I am down in Liverpool with Richie Clarke Pdc this week (Thursday 16th, Friday 17th & Saturday 18th April). 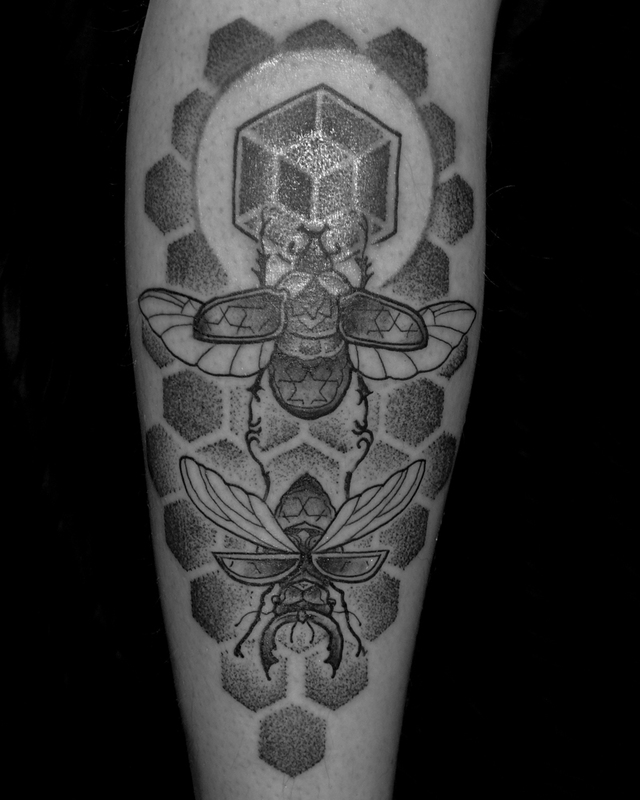 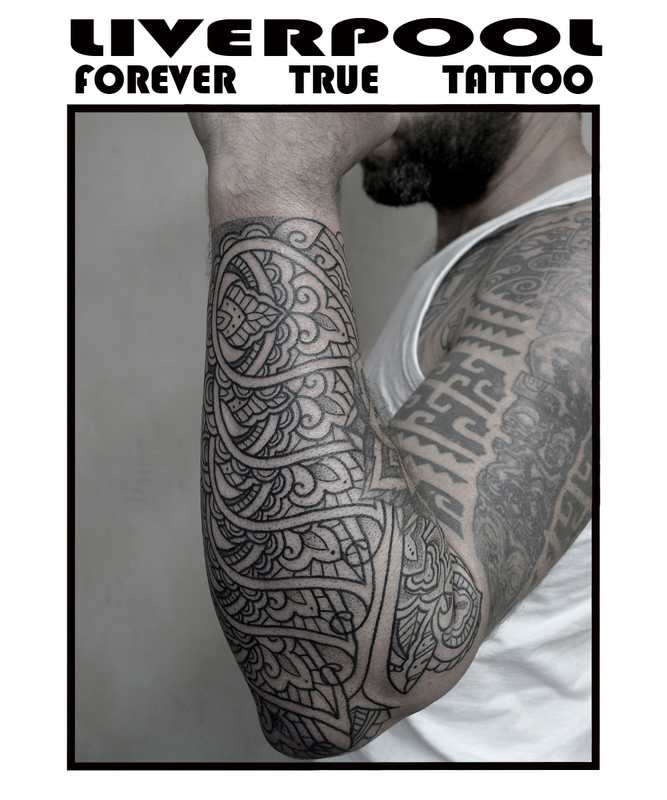 There are a couple of spaces left so drop me or Forever True Tattoo a line for bookings. 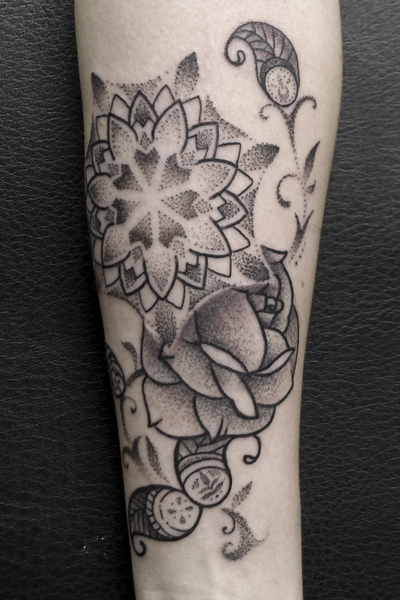 Since it was such a long time since I’d done an update (see previous entry) I had customers come back through again giving me the opportunity to see their tattoos all healed and settled in. 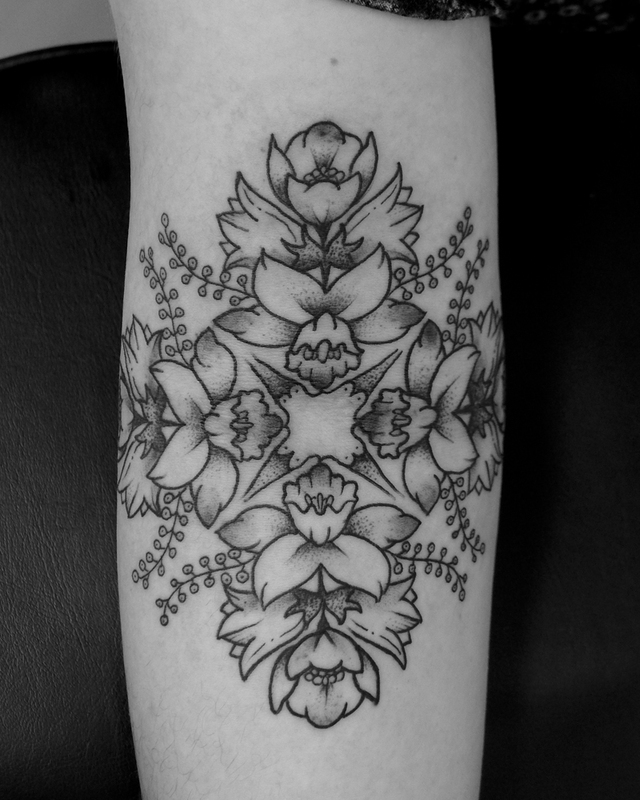 My goodness – it has been months since I last posted! 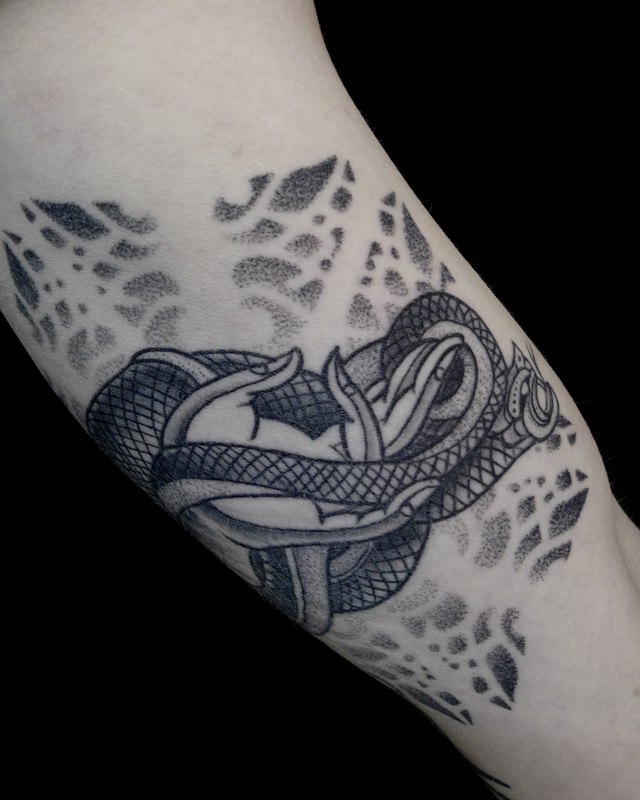 I have been busy and was away for most of February in California working at 2 Spirit Tattoo with the amazing crew there and then having a break with my wife on a roadtrip through southern Cali. 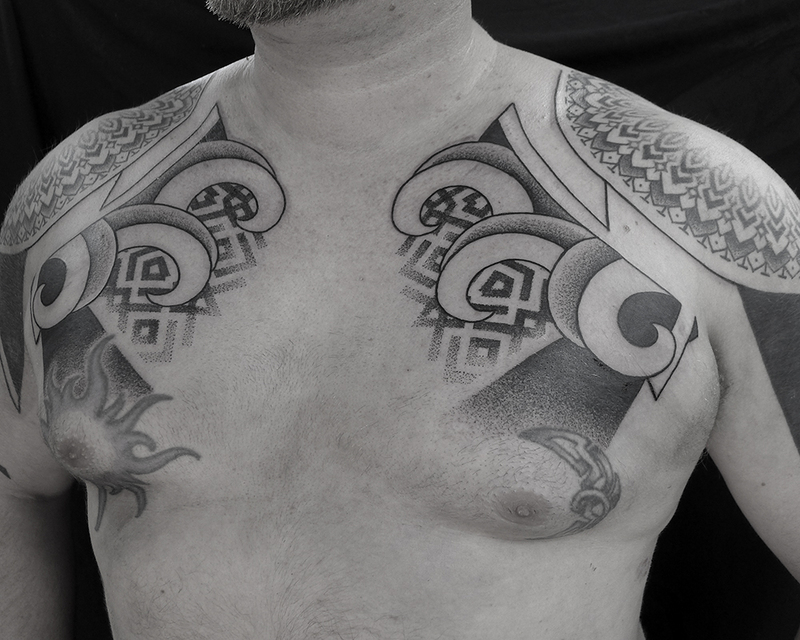 Without further ado here is some of the work I have been doing. 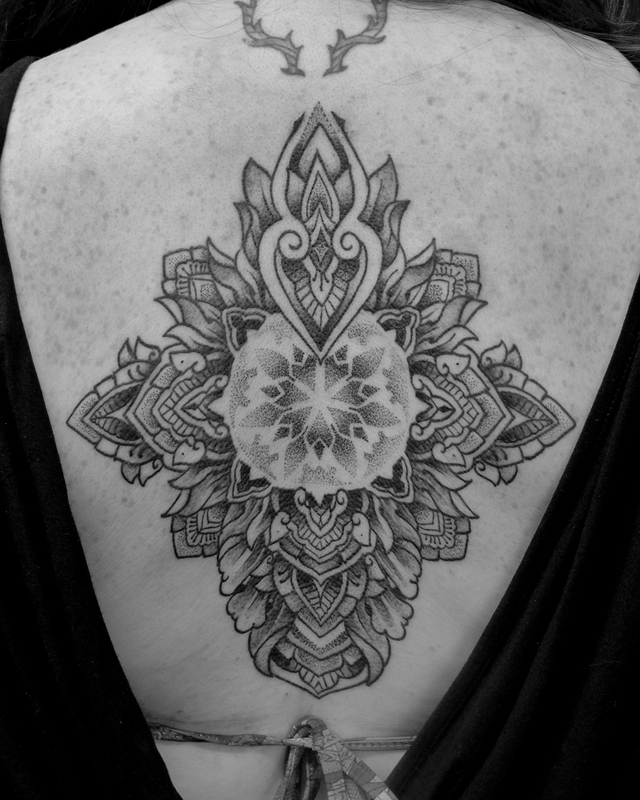 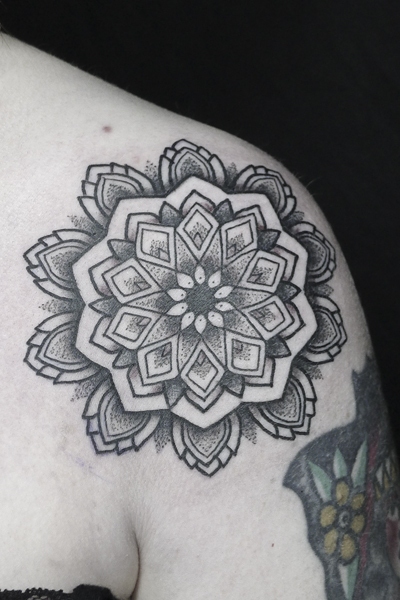 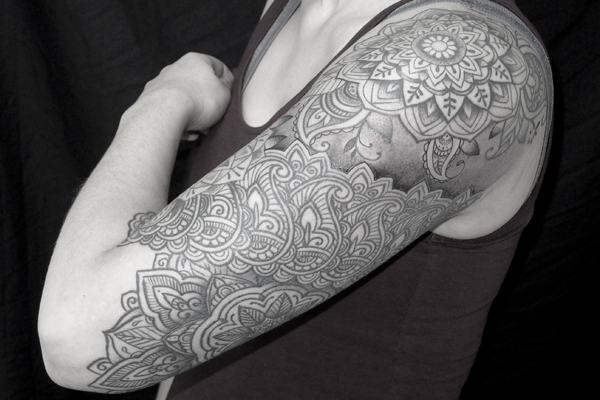 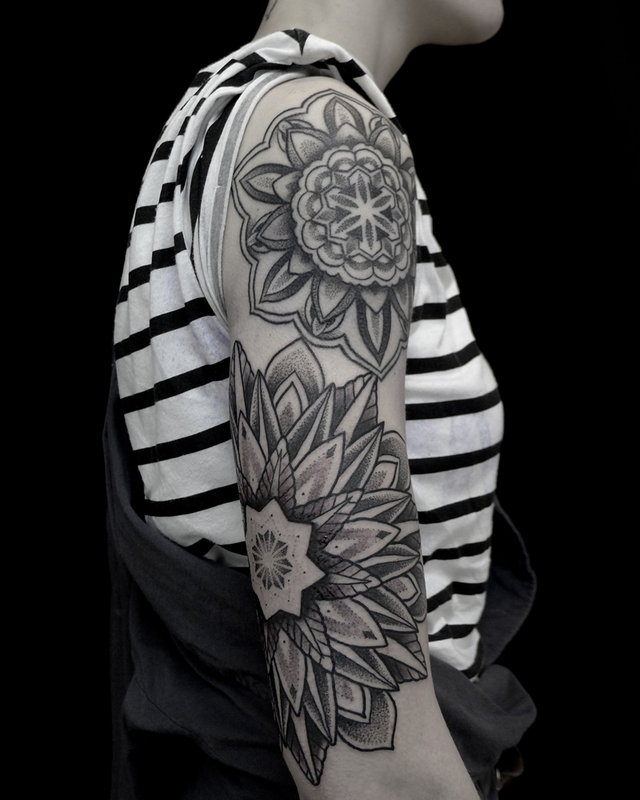 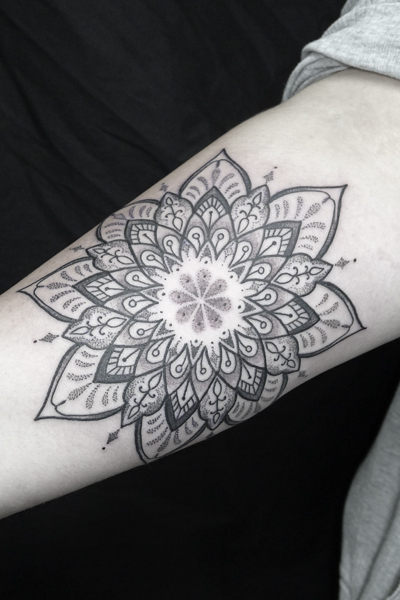 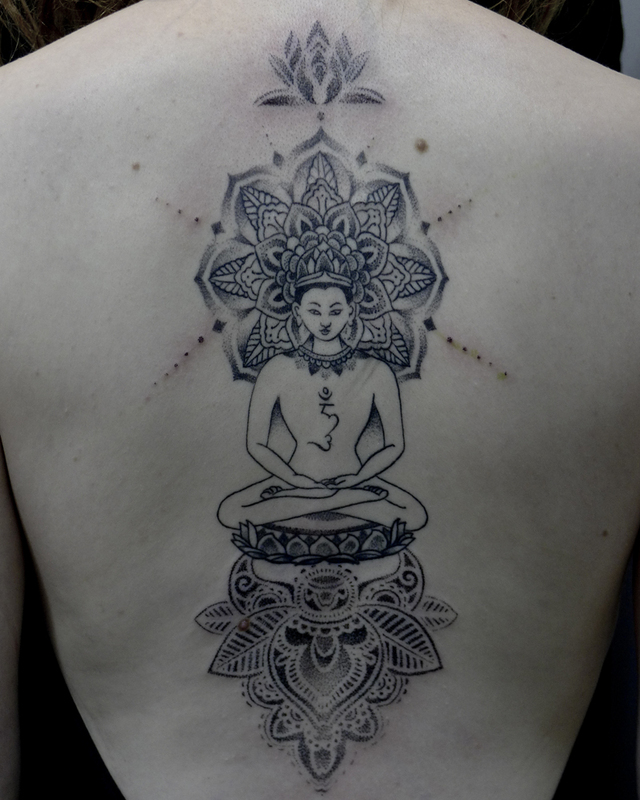 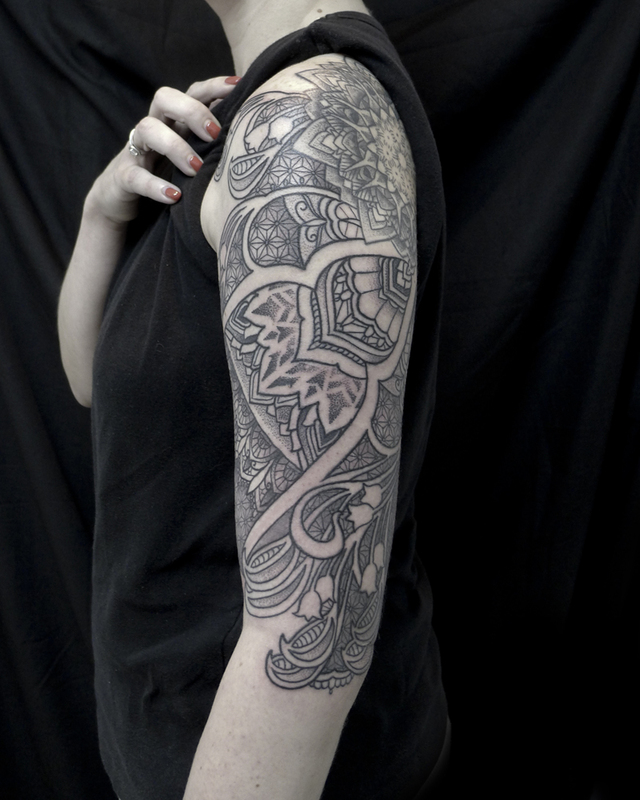 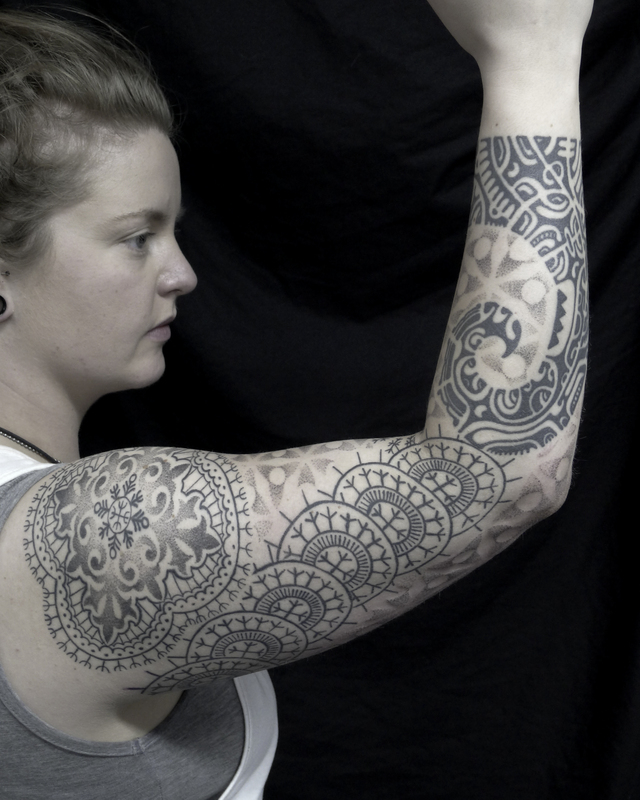 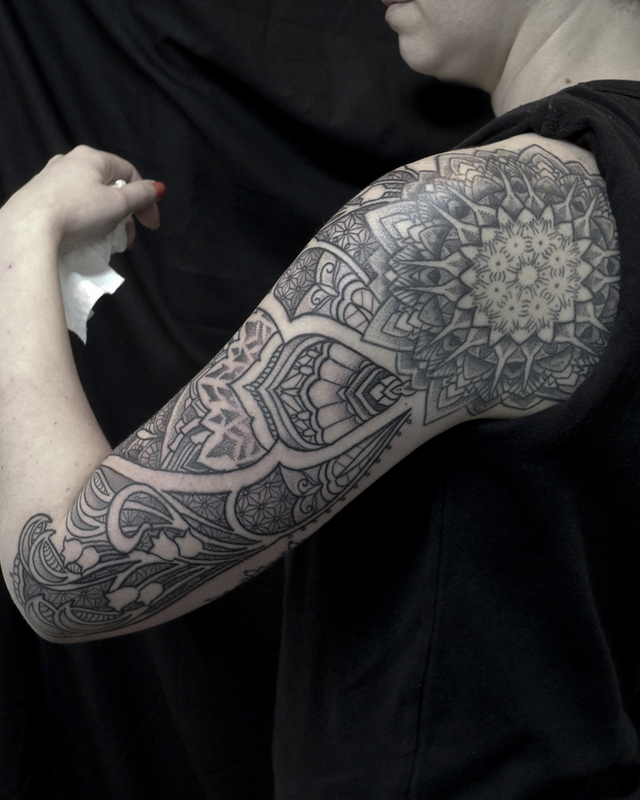 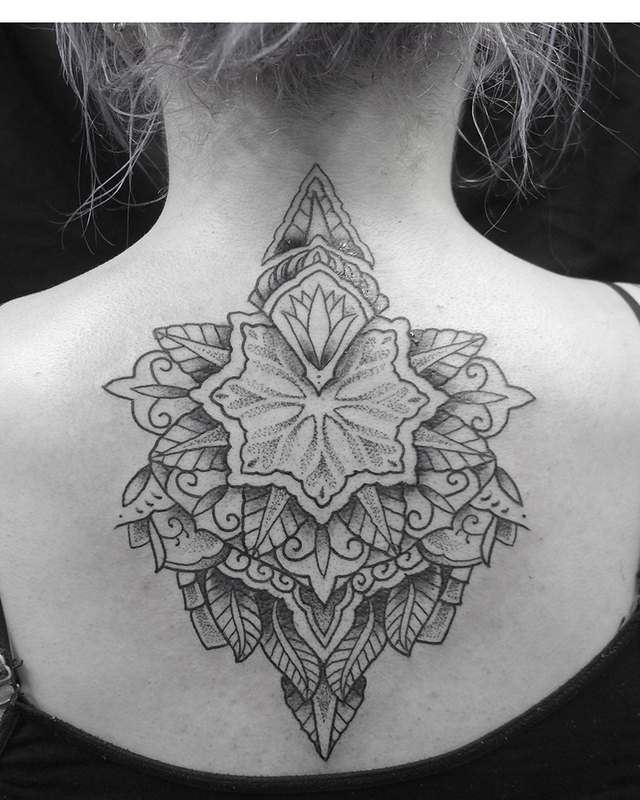 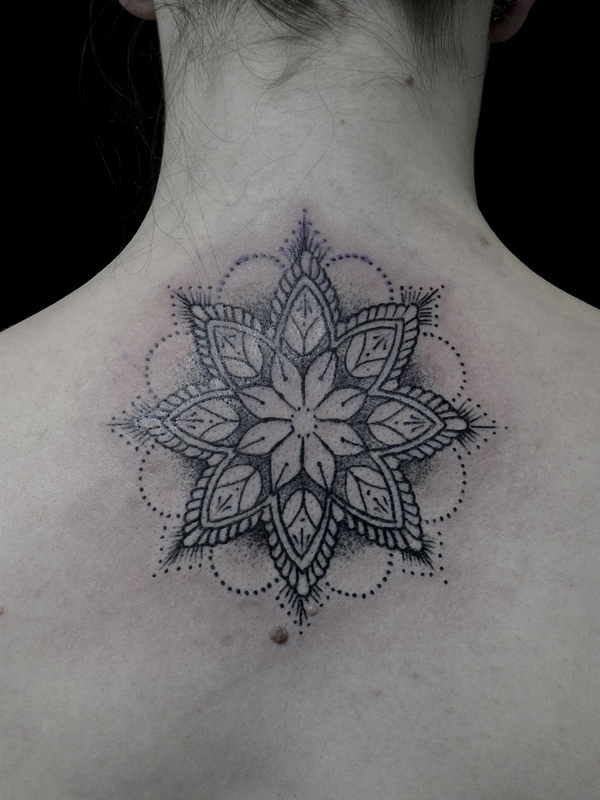 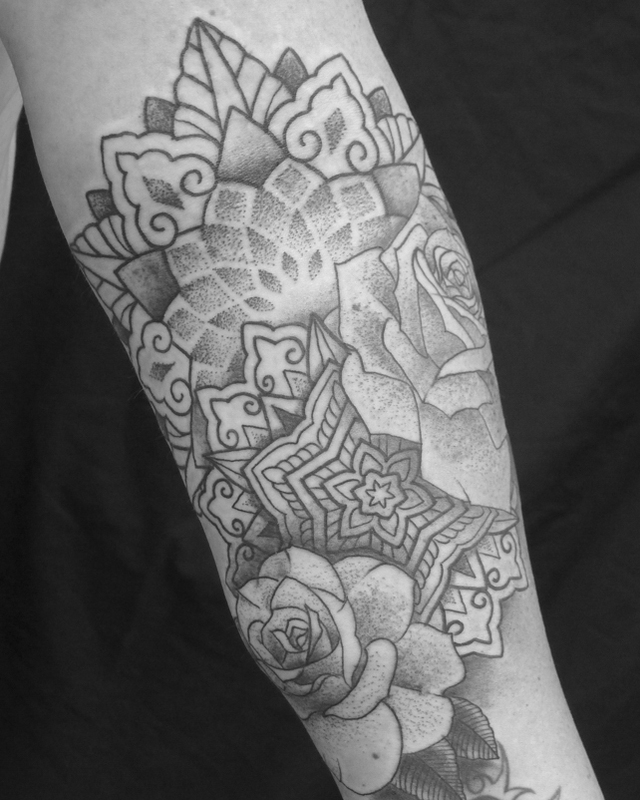 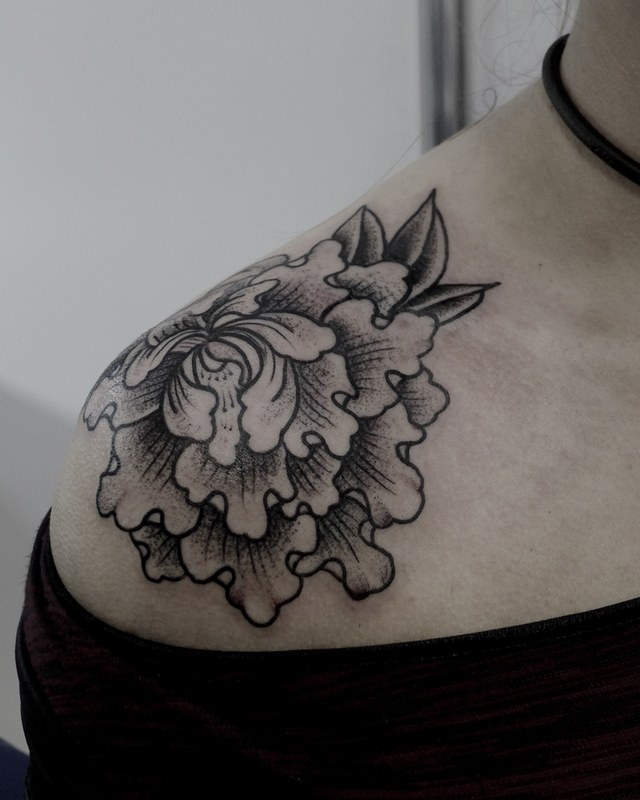 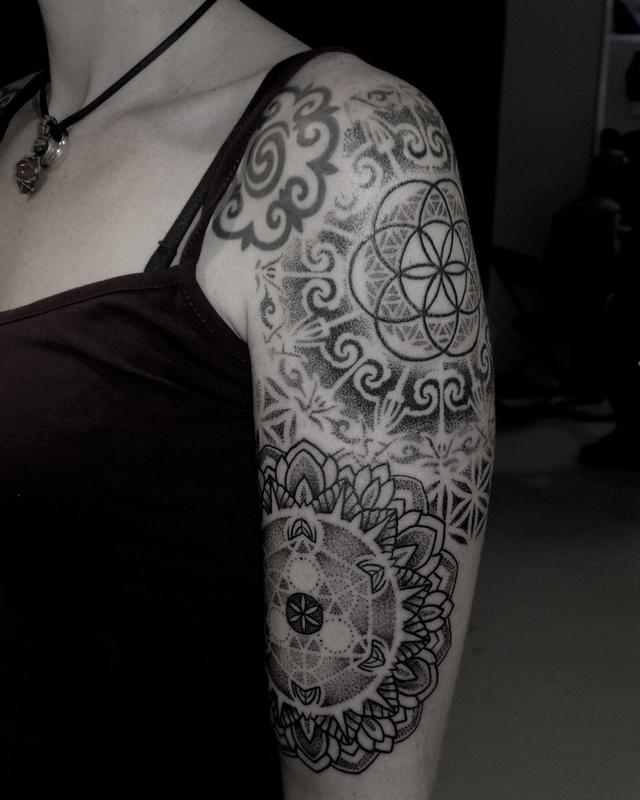 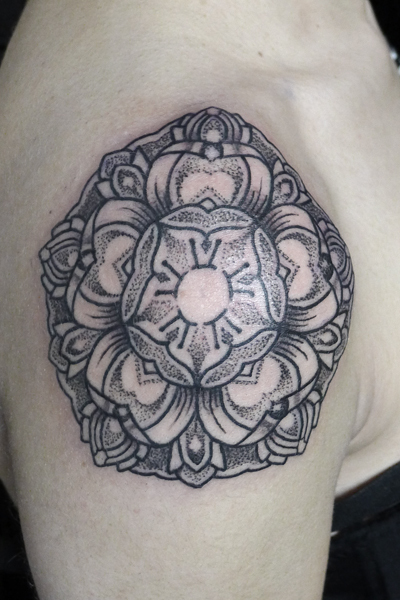 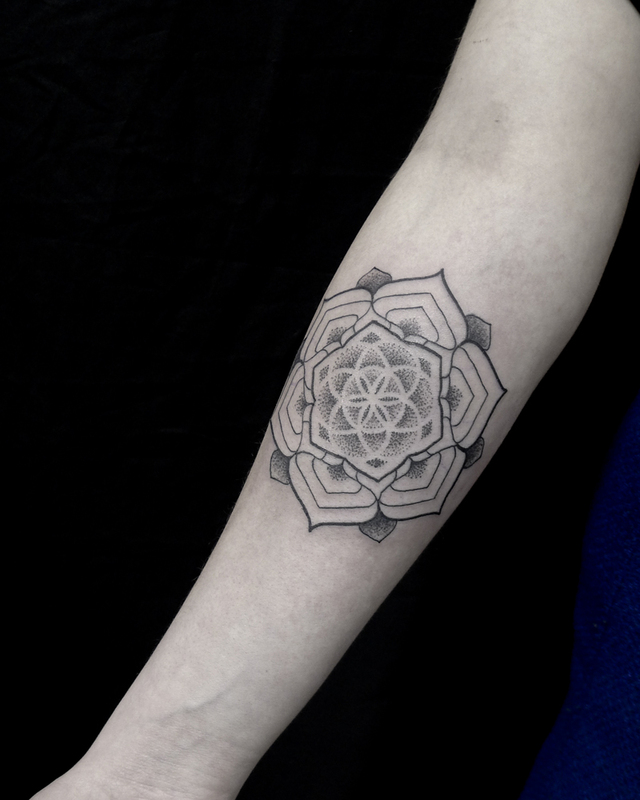 Carolina sat very well over a two day period to get this half sleeve done – I’d done the mandala at the back on her shoulder whilst working the Evian Tattoo Convention back in October 2014. 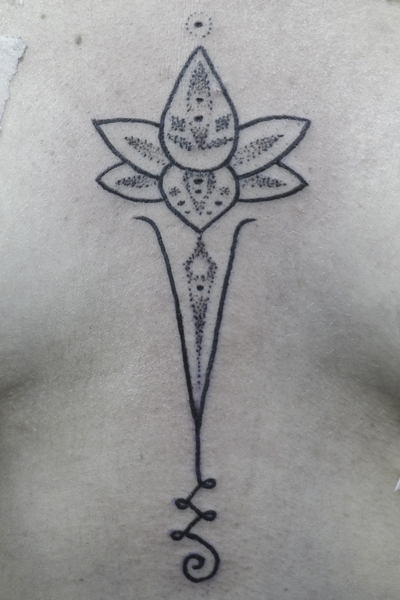 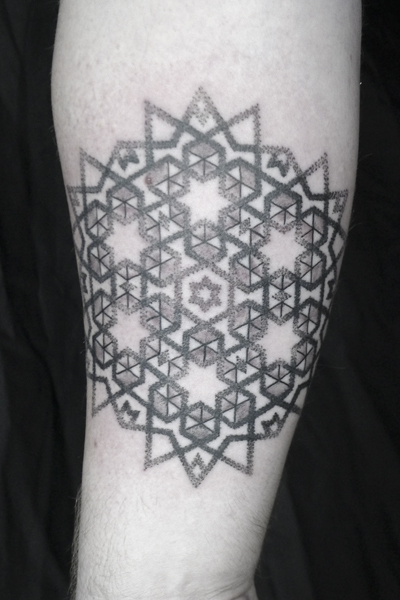 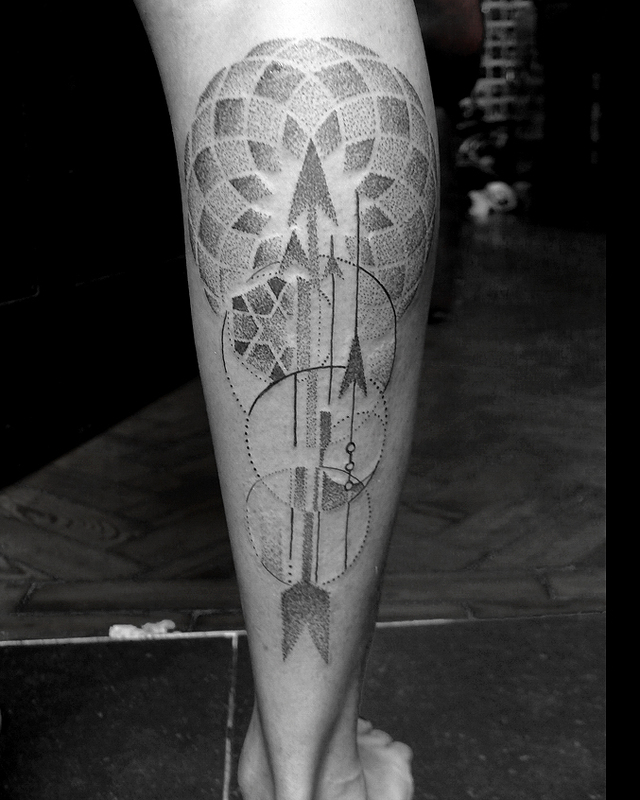 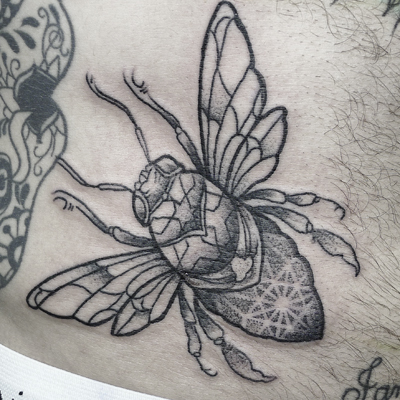 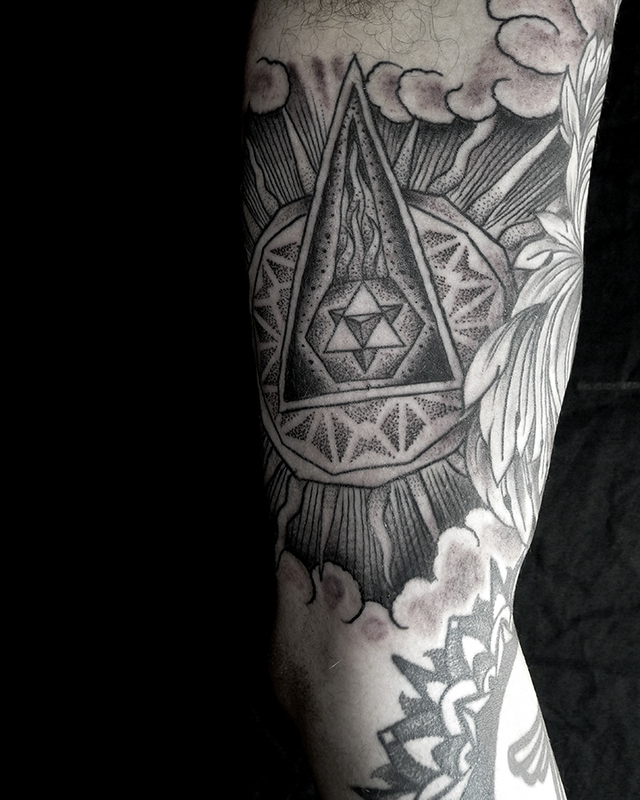 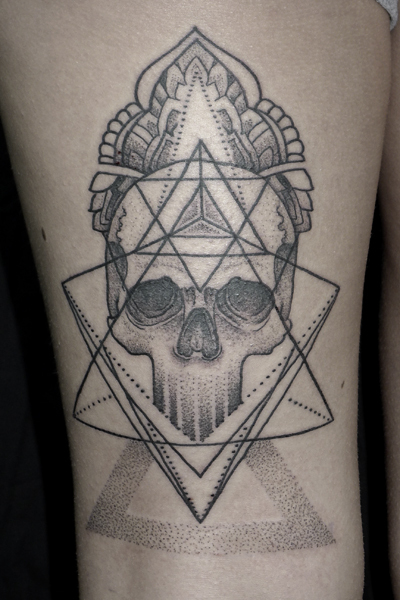 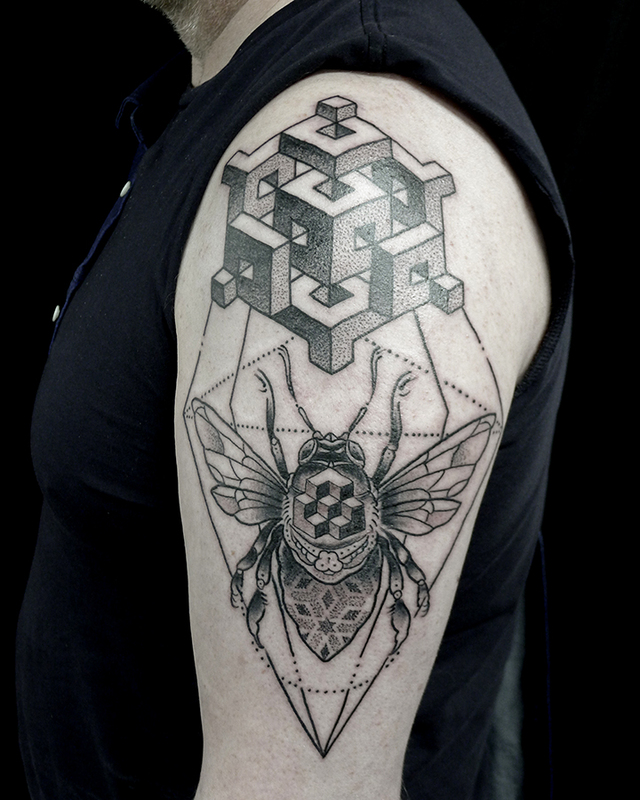 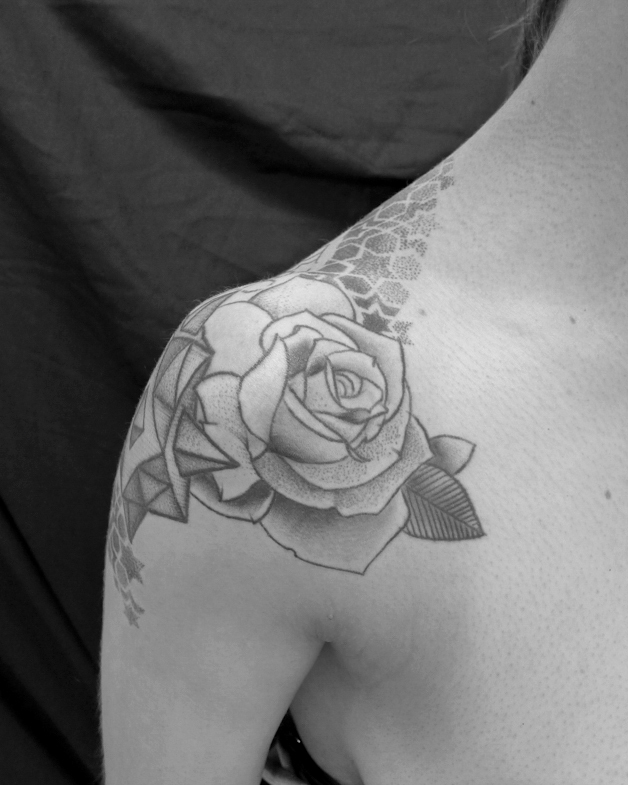 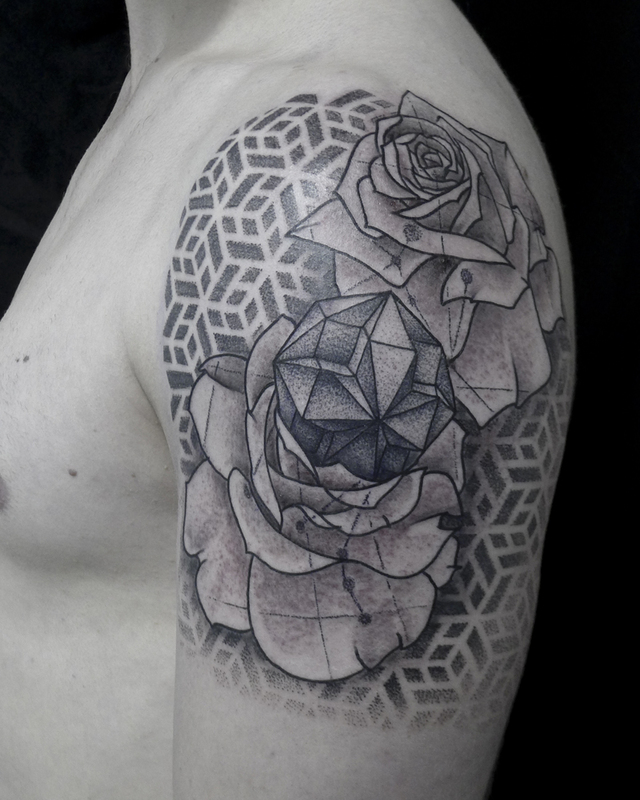 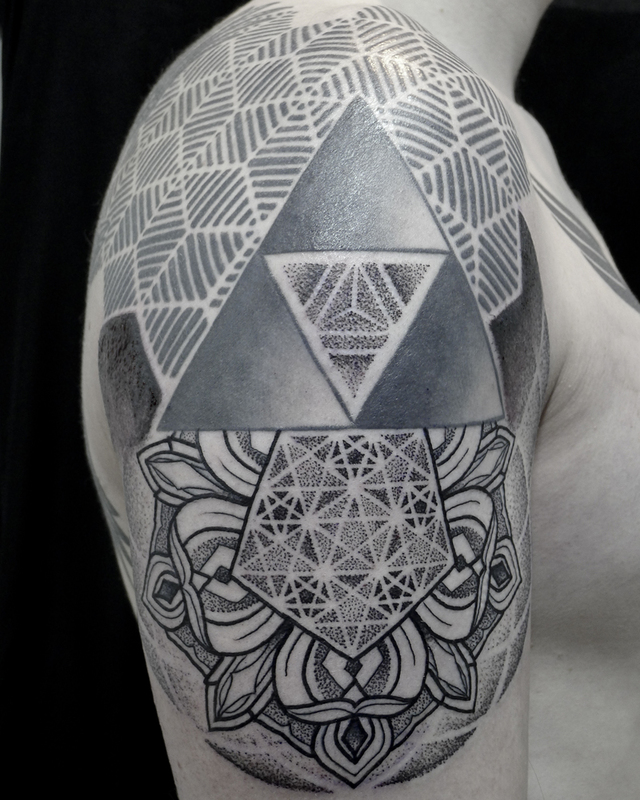 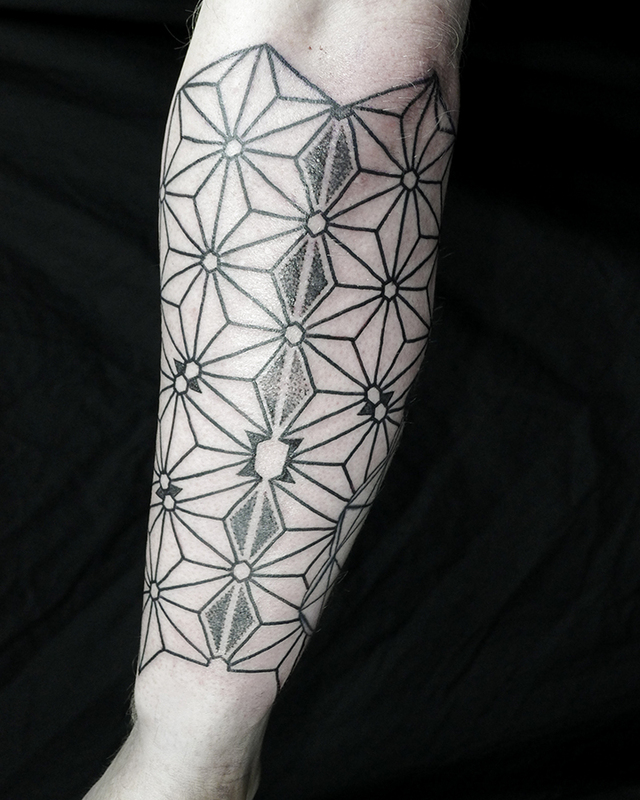 I added the Tudor Rose style piece to Jacks already existing triangle geometric work. 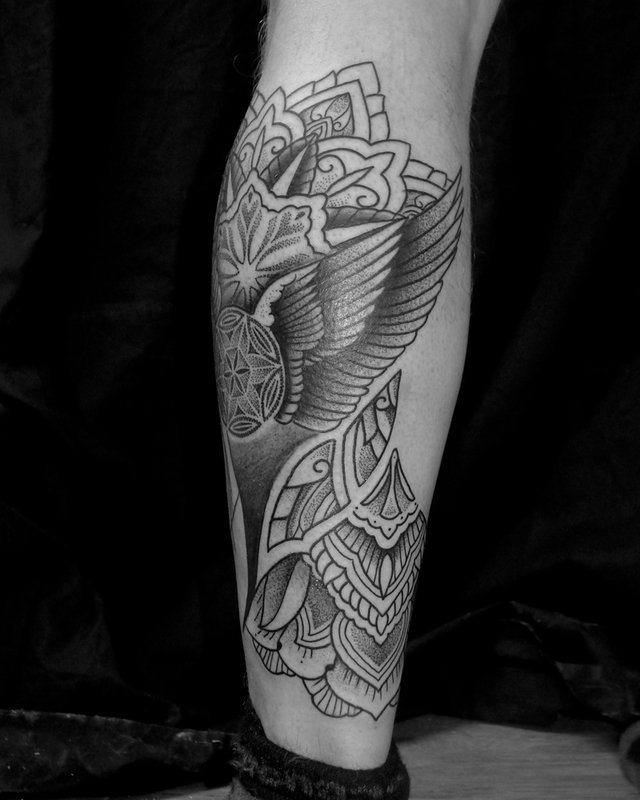 Robin already had a celtic piece at the top of his arm – this was a bit of a thorn in our sides but we just worked into and around it to make one design. 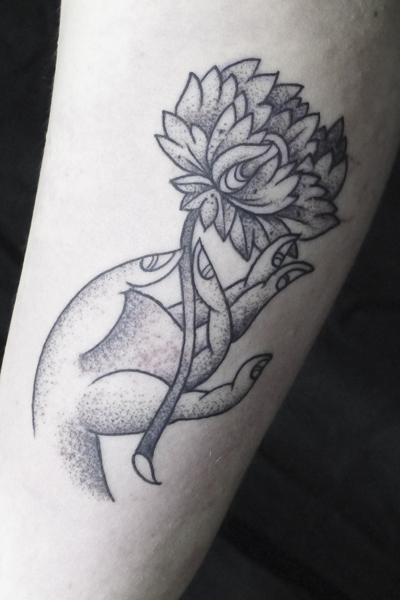 So I’ve rested up over Christmas, got to know my new additions to my family (of the kitten variety) , and am ready to start the new year, which is shaping up pretty well already. 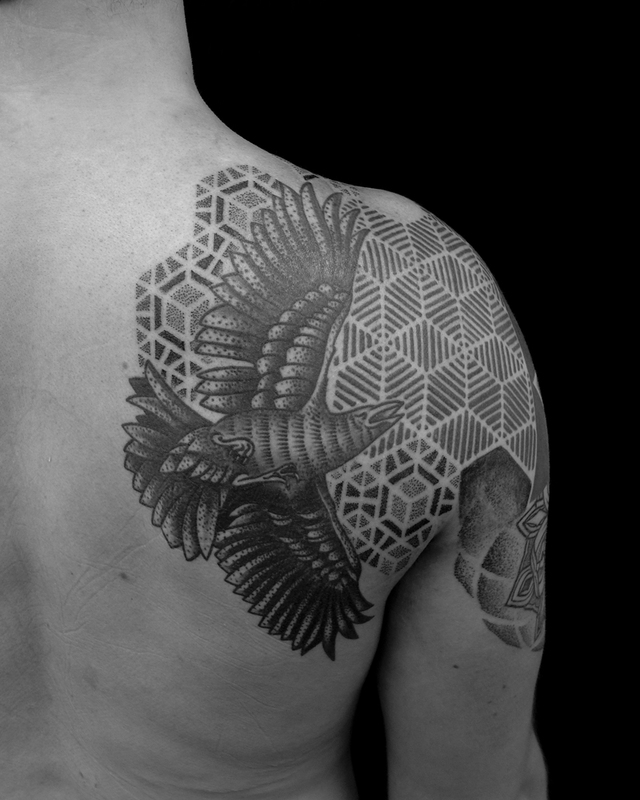 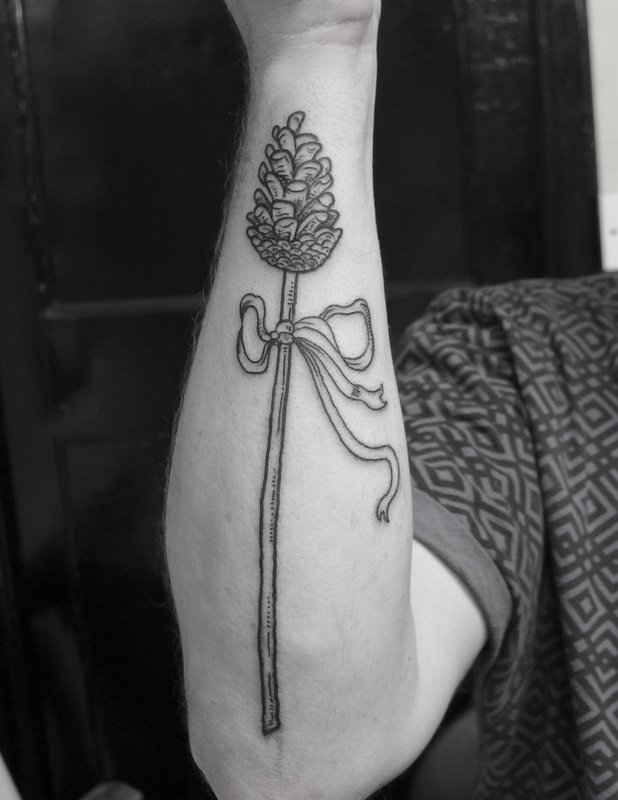 I ended last year with some nice tattoos, thanks to all my customers in Edinburgh, London, Stockholm, Brussels and Evian, hope to see some of you again this year. 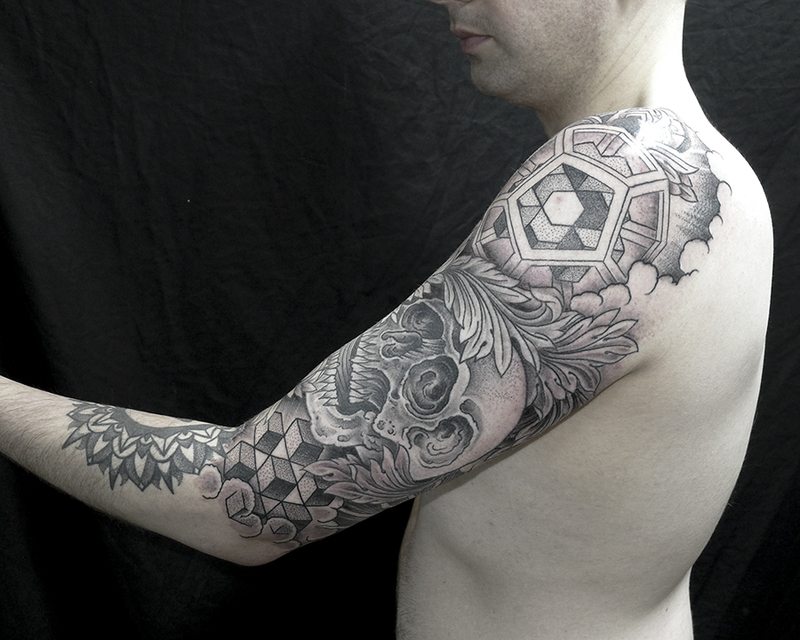 Here’s some of what I’ve been doing this past month. 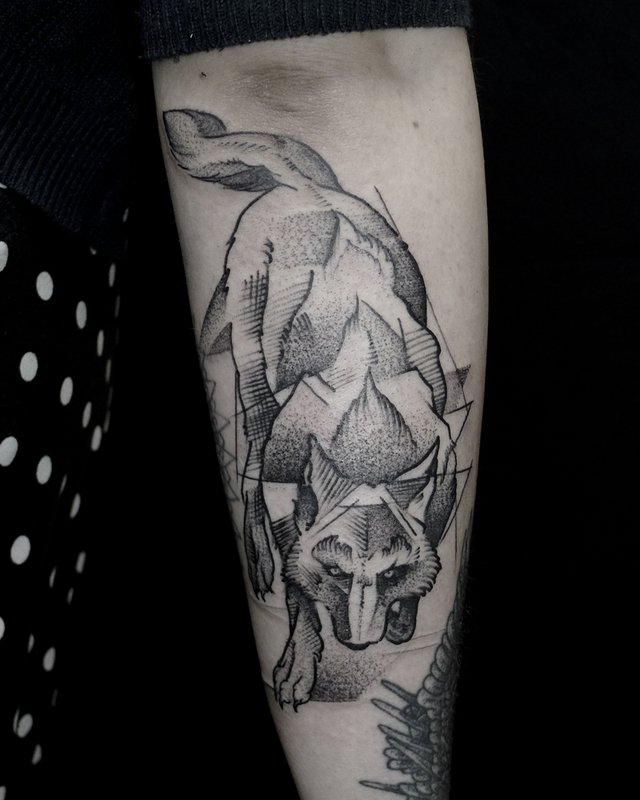 Wolf head all healed up now, just added the geo dotwork and the other arm. 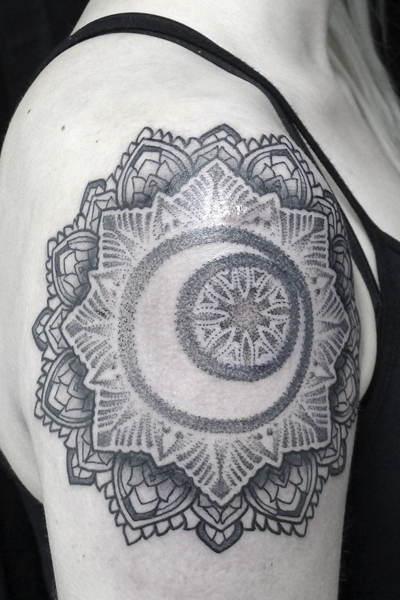 In progress mandalas going down back. 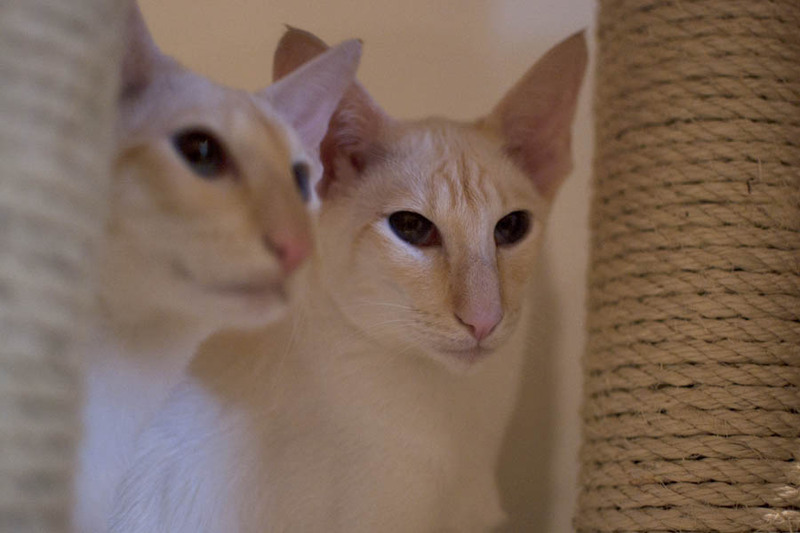 And here’s the new trouble makers, I’m allowed to be a proud parent just this once. 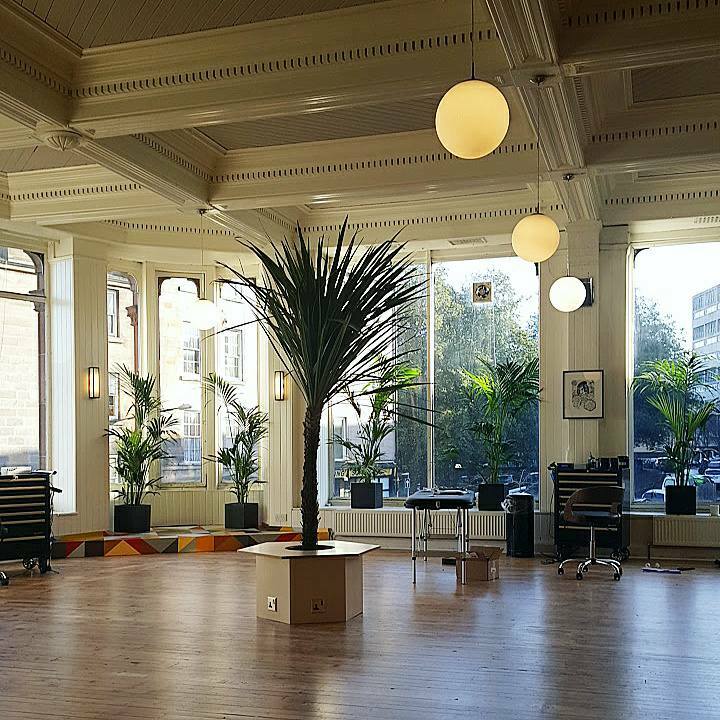 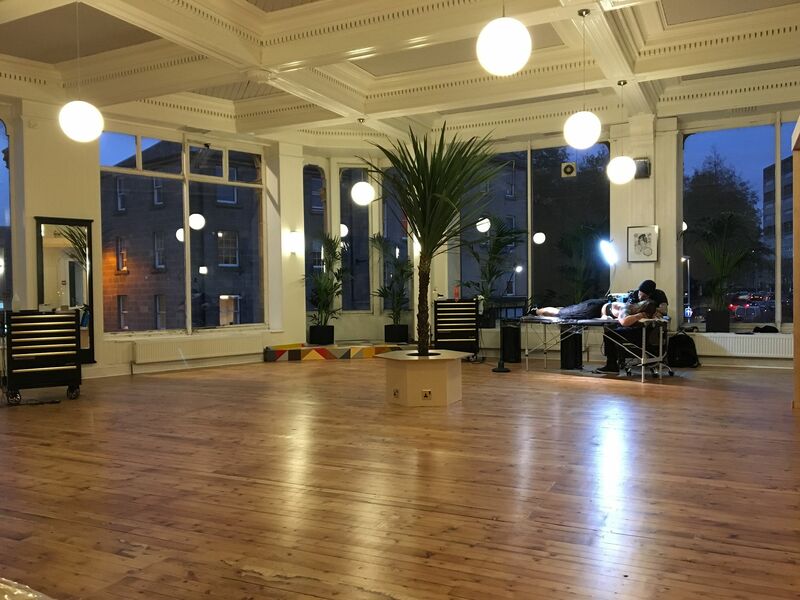 Exciting guest spot announcements coming up….